Motor skill learning is characterized by improved performance and reduced motor variability. The neural mechanisms that couple skill level and variability, however, are not known. The zebra finch, a songbird, presents a unique opportunity to address this question because production of learned song and induction of vocal variability are instantiated in distinct circuits that converge on a motor cortex analogue controlling vocal output. To probe the interplay between learning and variability, we made intracellular recordings from neurons in this area, characterizing how their inputs from the functionally distinct pathways change throughout song development. We found that inputs that drive stereotyped song-patterns are strengthened and pruned, while inputs that induce variability remain unchanged. A simple network model showed that strengthening and pruning of action-specific connections reduces the sensitivity of motor control circuits to variable input and neural ‘noise’. This identifies a simple and general mechanism for learning-related regulation of motor variability. ‘Practice makes perfect’ captures the essence of how we learn new skills. When learning to play a musical instrument, for example, it often takes hours of practice before we can play a single piece of music properly for the first time. And as we get better, the variability in our performance—which is an advantage during the early stages of learning—becomes less. Likewise, songbirds need lots of practice in order to master the intricate songs they need to sing to attract mates. Studies in songbirds show that the neural circuits in the brain that are responsible for producing song and for generating vocal variability both converge on a motor control region called the robust nucleus of the arcopallium (or RA for short). However, the details of how learning a song leads to reduced variability in vocal performance are poorly understood. Now Garst-Orozco et al. have investigated the relationship between learning and variability by studying brain slices of zebra finches. Their experiments reveal that the inputs received by RA neurons from a higher-order brain region that controls song change with practice, with some inputs becoming stronger and others being eliminated as the birds' singing ability improves. However, inputs received by RA neurons from the circuit that generates vocal variability do not change despite the song becoming increasingly precise. Using a computer simulation, Garst-Orozco et al. show that the sensitivity of RA neurons to variable or ‘noisy’ input is reduced when inputs from the brain region that controls song are adaptively strengthened and eliminated. This ensures that when the notes and syllables that make up the bird's song have finally been learned, they will be uttered with high fidelity and precision. Intriguingly, motor skill learning in mammals have been associated with neural connectivity changes very similar to those described by Garst-Orozco et al., suggesting that insights from songbirds may lead to a better understanding of how ‘practice makes perfect’ also works in humans. Our capacity to learn and reliably execute motor skills underlies much of what we do. Motor skill learning is characterized by high initial motor variability that is gradually reduced as performance improves and skills are consolidated (Figure 1A) (Lee et al., 1999; Park et al., 2013). Variability in motor output can be beneficial early in learning as it allows the motor system to explore a range of actions and selectively reinforce ones that improve performance (Sutton and Barto, 1998; Tumer and Brainard, 2007; Wu et al., 2014). But as viable solutions are found (a good tennis serve, for example), variability in motor output can become detrimental for expert performance and is often reduced. This capacity of the nervous system to regulate variability and plasticity in motor output as a function of learning or skill level enables new skills to be acquired and those already mastered to be stably expressed and maintained. However, the neural circuit mechanisms that regulate motor variability as a function of learning have not been identified. Probing the neural mechanisms underlying the regulation of motor variability in songbirds. (A) A strong coupling between performance improvements and variability reduction is a hallmark of most forms of motor skill learning. (B) Spectral derivatives of songs from a single zebra finch at different stages of song learning (dph-days post hatch) show a reduction in vocal variability as a function of learning. (C) The neural circuits associated with the acquisition and execution of song. HVC (red) and RA (purple) constitute the cortical part of the vocal motor pathway (VMP) and control the learned song; the anterior forebrain pathway (AFP, green), is essential for inducing vocal variability and guiding the song learning process. (D) Presumed functional organization of the motor pathway in which HVC represents time in the song (t) in the form of a synaptic chain network and RA neurons control specific muscles. Learning in the motor pathway is thought to be driven by plasticity in RA that is guided by input from LMAN, the output of the AFP. Addressing this question means linking learning-related changes in the motor circuits underlying skilled performance to a reduction in the variability of their action-related dynamics. While it is known that motor practice induces structural and functional changes in motor control circuits (Rioult-Pedotti et al., 1998; Xu et al., 2009; Wang et al., 2011; Fu et al., 2012), it is not clear how such modifications influence overall network function or how they lead to reduced neural and behavioral variability (Peters et al., 2014). Moreover, studies of plasticity in motor circuits have tended to focus on connectivity within anatomically confined motor regions (Sanes and Donoghue, 2000; Adkins et al., 2006), leaving open the question of how motor learning modifies connections between functionally distinct motor areas. Consequently, the logic by which motor skills are acquired and consolidated in neural circuitry and how this may contribute to reduced variability in motor output has remained elusive. The zebra finch, a songbird, presents an experimentally tractable model in which to address these questions (Brainard and Doupe, 2002; Mooney, 2009; Ölveczky and Gardner, 2011). Male birds learn a complex motor sequence—their courtship song—by first memorizing the song of a tutor, then engaging in trial-and-error learning to match their vocalizations to a stored template of their tutor's song (Immelmann, 1969; Tchernichovski et al., 2001). As with human motor skill learning, birdsong learning is characterized by gradual improvements in performance (similarity to the tutor song) and decreased motor variability (Tchernichovski et al., 2001; Ölveczky et al., 2011) (Figure 1A,B). Two main pathways are involved in the acquisition and production of the bird's song. The Vocal Motor Pathway (VMP), which comprises HVC (used as proper name) and the robust nucleus of the arcopallium (RA) (Figure 1C,D), encodes and controls learned vocalizations (Simpson and Vicario, 1990; Yu and Margoliash, 1996; Leonardo and Fee, 2005). The Anterior Forebrain Pathway (AFP), a song-specialized basal-ganglia-thalamo-cortical circuit, provides input to the VMP at the level of RA and is necessary for vocal exploration and learning (Bottjer et al., 1984; Scharff and Nottebohm, 1991; Kao et al., 2005; Ölveczky et al., 2005). During singing, RA-projecting HVC neurons fire sparse and song-locked spike bursts that are thought to control song timing (Hahnloser et al., 2002; Long and Fee, 2008; Ali et al., 2013). Projection neurons in RA drive brainstem motor neurons that innervate muscles involved in singing (Vicario, 1991; Wild, 1997). Given this functional architecture, song learning has been cast as the process of transforming the timing signal in HVC into effector-specific RA motor commands by establishing connections between time-keeper neurons in HVC and muscle-related neurons in RA appropriate for producing the desired vocal output (Figure 1D) (Fee et al., 2004; Fiete et al., 2004, 2007; Fee and Goldberg, 2011). Inputs to RA from the lateral magnocellular nucleus of the anterior neopallium (LMAN), the cortical outflow of the AFP, is thought to guide the learning process within RA by adding variability to the motor program (Kao et al., 2005, 2008; Ölveczky et al., 2005, 2011; Thompson and Johnson, 2007) and mediating auditory feedback-based error-correction (Brainard and Doupe, 2000; Andalman and Fee, 2009; Warren et al., 2011; Charlesworth et al., 2012). Thus, the capacity for exploration and learning is promoted by inputs to RA from LMAN, while the consolidation of learned song occurs within the HVC-RA network. Early in song learning, when vocal exploration is needed to drive trial-and-error learning, the RA motor program is dominated by LMAN input (Aronov et al., 2008; Ölveczky et al., 2011), but as learning proceeds and exploitation of the learned vocal patterns becomes essential for successful courtship, the temporally precise inputs from HVC take over and the premotor role of LMAN decreases (Ölveczky et al., 2005; Aronov et al., 2008). What are the circuit-level changes that underlie this shift in premotor control and hence reduction in vocal variability? Is it age-dependent attenuation of LMAN input to RA, developmental changes in HVC input, or both? Addressing this question requires a thorough circuit-level characterization of the developmental changes in both HVC and LMAN input to RA. While prior studies have examined anatomical correlates of song development in RA and shown significant age-related changes in both the spine density of RA neurons (Herrmann and Arnold, 1991; Kittelberger and Mooney, 1999) and HVC terminal bouton frequency (Kittelberger and Mooney, 1999), how these anatomical changes translate into functional changes in VMP connectivity is not clear. And though the relationship between HVC fiber stimulation and evoked postsynaptic potentials in RA neurons is known to be age-dependent (Kittelberger and Mooney, 1999), the detailed nature of the underlying changes in circuitry has not been revealed. Similarly, our understanding of how LMAN inputs to RA neurons change during song development—essential for understanding regulation of motor variability—is lacking. Here, we examine changes in the distribution and relative number of HVC and LMAN input to RA neurons as a function of song development. We show that while HVC-RA connections undergo significant strengthening and pruning, inputs from LMAN remain largely unchanged throughout. This suggests that LMAN's effectiveness in inducing motor variability and promoting plasticity is curtailed by the strengthening and pruning of HVC-RA connections. A simple network model shows how strengthening and pruning of action-specific connections in motor control circuits makes the dynamics in those circuits less sensitive to external sources of variability (e.g. LMAN) and neural ‘noise’. This identifies a simple and general circuit-level mechanism for learning-related regulation of motor variability. To characterize how inputs to RA change as a function of sensorimotor learning, we used birds of ages corresponding to three distinct phases of song learning (‘Materials and methods’, Figure 1B): (1) Subsong (40–45 days post-hatch, dph)—the earliest stage of sensorimotor learning characterized by highly variable songs driven largely by LMAN (Aronov et al., 2008); (2) Plastic song (60–65 dph)—an intermediate stage of development characterized by recognizable but variable song elements or syllables that are subject to further change; (3) Crystallized song (90–130 dph)—adult stage at which a stereotyped and stable version of the bird's courtship song has developed (Immelmann, 1969; Price, 1979). RA has two major cell types: excitatory projection neurons and inhibitory interneurons (Spiro et al., 1999). Adult vocalizations are driven by the precise burst firing of RA projection neurons (Simpson and Vicario, 1990; Yu and Margoliash, 1996; Leonardo and Fee, 2005) that are thought to be largely triggered by inputs from time-keeper neurons in HVC (Hahnloser et al., 2002; Hahnloser, 2006). Activity in RA projection neurons is further influenced by inputs from LMAN (Ölveczky et al., 2005; Kao et al., 2008), which induce variability in the RA motor program during singing (Ölveczky et al., 2011). This organization makes the connections between HVC and RA projection neurons a likely site of learning and memory (Doya and Sejnowski, 1995; Fee et al., 2004; Fiete et al., 2007) and the inputs from LMAN to RA an important locus for driving motor variability and plasticity (Figure 1D) (Kao et al., 2005; Ölveczky et al., 2011). Thus, our current study focuses on RA projection neurons and how their inputs from HVC and LMAN, as well as their intrinsic properties, change during learning. Experiments were done in acute brain slices that included a large fraction of RA (Figure 2A; ‘Materials and methods’). Because LMAN and HVC fibers enter RA in different planes (Mooney and Konishi, 1991; Mooney and Rao, 1994), we used two different slices to probe inputs from the respective nuclei, optimizing for the number of input fibers for each experiment (‘Materials and methods’). 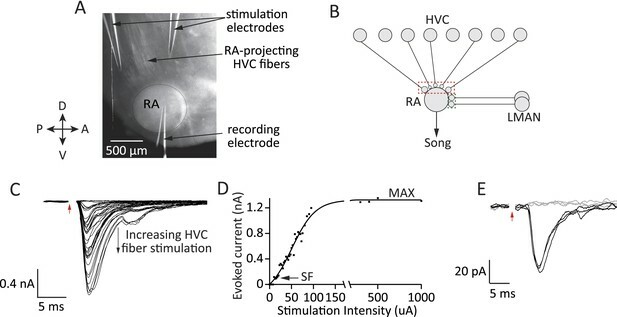 Input strength was probed by stimulating the fiber tract entering RA from HVC or LMAN at different stimulation intensities (Figure 2B, ‘Materials and methods’) and recording evoked currents in RA projection neurons under whole-cell voltage clamp (Figure 2C,D). Experimental approach for probing inputs to RA projection neurons from LMAN and HVC during different stages of song development. (A) Bright-field image of an acute brain slice encompassing RA and incoming fibers from HVC (parasaggital slice). The fibers are stimulated and evoked currents from RA projection neurons recorded in voltage clamp. (B) Using different slices we can interrogate the number and strength of HVC (red) and LMAN (green) inputs to RA projection neurons. (C–D) Increasing the stimulation intensity activates increasingly more input fibers, allowing us to measure single fiber (SF) currents and maximal (MAX) currents. Examples of HVC fiber-evoked currents in a plastic-song bird. (E) Single fiber currents were measured at stimulus intensities that produced both failures (grey traces) and evoked EPSCs of reliable amplitude (black traces, see also ‘Materials and methods’). Data from stimulating a putative single HVC fiber in a plastic-song bird. In C and E, red arrow denotes time of stimulation. Stimulus artifacts removed. Drawing on the characterization of synaptic refinement at the retinogeniculate synapse (Hooks and Chen, 2006; Noutel et al., 2011), we used the metrics of Single Fiber (SF) and Maximal (MAX) current to estimate the relative strength and number of LMAN and HVC inputs. SF currents from individual fibers were recorded at a stimulus intensity that produced a mixture of evoked unitary EPSCs of consistent peak amplitude and failures (Figure 2E, ‘Materials and methods’). The peak of the single fiber-evoked EPSC (SF current) was used to gauge the strength of inputs from single HVC or LMAN neurons. MAX currents, estimated from the peak EPSC at saturating stimulus intensities (Figure 2C,D; ‘Materials and methods’), were used to approximate the overall drive from HVC or LMAN fibers to single RA projection neurons. 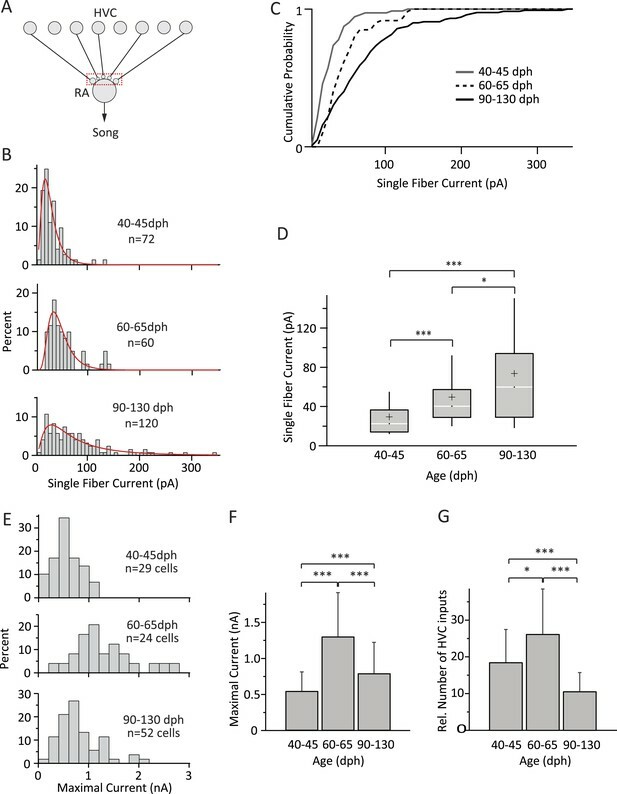 We first characterized the strength of single HVC inputs to RA projection neurons across the three age categories by recording HVC-fiber-evoked SF currents in 176 RA cells in 86 birds (Figure 3A). By stimulating the HVC fiber tract using an array of stimulation electrodes (‘Materials and methods’), we were often able to characterize more than one SF input to a single cell (on average 1.65 ± 0.81; mean ± SD). Inputs from HVC to RA neurons change throughout song development. (A) Schematic highlighting the inputs being probed (red box). (B) Distributions of SF currents for the three age groups tested. Red line represents the log-normal fit to the data (‘Materials and methods’). (C) Cumulative SF current distributions. (D) Box and whisker plots showing the median (white line), IQR (grey box), mean (+), and the 10th and 90th percentile of the SF current distributions (whiskers). (E) Distributions of MAX currents for the three age groups. (F) Average MAX currents. (G) Average number of HVC inputs to an RA projection neuron in our slice preparation. Error bars in F and G denote standard deviations. While HVC input to RA is mediated by both AMPA and NMDA receptors (Mooney and Konishi, 1991; Mooney, 1992), the NMDA component is not thought to be essential for driving song in either juvenile (Ölveczky et al., 2005) or adult (Charlesworth et al., 2012) birds, and we thus characterized the strength of HVC-RA connections by recording AMPA receptor (AMPAR)-mediated currents at a holding potential (Vh) of −70 mV (Stark and Perkel, 1999). The shapes of the SF current distributions were strikingly similar to synaptic weight distributions found in other systems (Song et al., 2005; Barbour et al., 2007), and could be well approximated by a log-normal fit for all three age groups (Figure 3B). SF currents shifted to higher values with age, indicating a gradual strengthening of HVC inputs throughout learning (Figure 3B–D). For example, while only 3% [2/72] of the SF inputs were stronger than 100 pA in subsong birds, this fraction increased to 8% [5/60] in plastic-song birds and to 21% [25/120] in adults. The median SF current also increased from 22.5 pA (IQR: 22.5, n = 72 SFs in 55 cells) in subsong birds (n = 24 birds) to 40.2 pA (IQR: 28.4; n = 60 SFs in 42 cells; p = 3 × 10−7) in plastic-song birds (n = 23 birds) and 59.8 pA (IQR: 65.0, n = 120 SFs in 79 cells) in adult birds (n = 39 birds, p = 0.02 comparing second and third age categories, Figure 3D). Consistent with a prior study (Kittelberger and Mooney, 1999), the input resistance of RA projection neurons did not change significantly with age (Table 1), an indication that our measurements of SF currents were not confounded by changes in intrinsic cell properties. The strengthening of HVC SF inputs across age categories was also accompanied by a reduction in the variability (CV) of single fiber EPSCs across repeated stimulations (Table 1). Values are mean ± SD *Versus Subsong Juvenile; **versus plastic-song juvenile; statistically significant differences in bold. Wilcoxon Rank–Sum Test: used when one or more of the distributions under comparison were significantly non-parametric, as determined by the Kolmogorov–Smirnov. In addition to stronger SF inputs, song development was accompanied by marked but non-monotonic changes in the overall input drive from HVC to RA neurons (Figure 3E,F; Table 1). While MAX currents more than doubled from 0.55 ± 0.26 nA (n = 29 cells; mean ± SD) in subsong to 1.31 ± 0.61 nA in plastic-song (n = 24 cells, p = 3 × 10−6), the trend reversed and MAX currents subsequently decreased by ∼40% over the last month of song learning to 0.80 ± 0.43 nA in crystallized adults (n = 52 cells, p = 7 × 10−4 as compared to plastic-song, Figure 3F). This suggests very significant pruning of HVC inputs during later stages of sensorimotor learning. To address the change in the number of functional HVC inputs to RA projection neurons in our slice, we estimated the relative number of inputs by dividing the MAX current for each cell by the age-matched mean SF current (‘Materials and methods’). This revealed a 1.4-fold increase in the average number of HVC inputs during early sensorimotor learning from 18.7 ± 8.9 in subsong birds to 26.4 ± 12.2 in plastic-song birds (p = 0.01), followed by a 2.4-fold decline to 10.8 ± 5.8 in crystallized-song adults (p = 2 × 10−6 between plastic-song and adult, Figure 3G). We next examined how inputs from LMAN to RA change with learning (Figure 4A). Despite a reduction in the size of LMAN with development (Bottjer et al., 1985; Bottjer and Sengelaub, 1989), the number of RA-projecting LMAN neurons remains largely unchanged during sensorimotor learning (Nordeen et al., 1992), as does the topography of LMAN projections to RA (Iyengar et al., 1999). Yet whether and how the functional properties of these inputs change during song learning is not known. To address this, we employed the same experimental strategy as for HVC-RA connections, but in coronal slices that isolated LMAN inputs to RA (‘Materials and methods’), measuring LMAN-fiber evoked EPSCs at both +40 mV and −70 mV (Figure 4B). Input strength was characterized at the depolarized holding potential because, unlike HVC inputs, inputs from LMAN are mediated predominantly by NMDA receptors (NMDARs) (Mooney and Konishi, 1991; Mooney, 1992; Stark and Perkel, 1999), which are blocked by Mg2+ at −70 mV (Mayer et al., 1984; Nowak et al., 1984). Inputs from LMAN to RA neurons remain largely unchanged throughout song development. (A) Schematic highlighting the inputs being probed (green box). (B) Currents evoked in response to stimulating the LMAN fiber tract with an intensity resulting in either failures (grey) or EPSCs of consistent amplitudes (black). Top: at a holding potential (Vh) of +40 mV, where both AMPA- and NMDA receptor-mediated currents are measured. Bottom: holding potential of −70 mV, where AMPAR-mediated currents dominate. Stimulus artifacts removed. (C) Distributions of SF currents at Vh = +40 mV for the three age groups tested. (D) Cumulative SF current distributions. (E) Box and whisker plots showing the median (white line), IQR (grey box), mean (+), and the 10th and 90th percentile of the SF current distributions (whiskers). (F) The mean ratio of SF currents evoked at Vh = +40 mV (AMPA and NMDA receptor mediated) and −70 mV (AMPAR mediated). (G) Average MAX currents. (H) Average number of LMAN inputs to an RA projection neurons in our slice preparation. Error bars in F, G, and H denote standard deviations. In contrast to HVC SF inputs, the distribution of LMAN SF EPSCs did not change significantly across the three age categories (Figure 4C,D). The median SF peak EPSC was 138.32 pA (IQR: 202.0 pA, n = 40 SFs in 24 cells) in subsong birds (n = 7 birds), 90.73 pA (IQR: 143.5 pA, n = 45 SFs in 30 cells) in plastic-song birds (n = 13 birds), and 94.41 pA (IQR: 136.5 pA, n = 38 SFs in 33 cells) in adult birds (n = 12 birds; p > 0.1 for all pairwise Mann-Whitney-Wilcoxon test comparisons, Figure 4E). Though the mean strength of SF LMAN input was near identical in plastic-song and adult birds (146.1 and 142.3 pA respectively, p = 0.75), these numbers were ∼25% lower than the mean SF input in subsong birds. Though this difference did not reach statistical significance (p > 0.12), we cannot rule out a slight developmental weakening of LMAN SF input early in sensorimotor learning. There was also no significant change in the shape of the SF distributions across the different age categories (p > 0.1 for all pairwise Kolmogorov–Smirnov test comparisons). The CV of the peak EPSC amplitude for successive stimulations of the same SF (Table 2) was also similar across the age groups (p > 0.2 for all pairwise Student's t test comparisons). The ratio of peak SF EPSC at a holding potential (Vh) of −70 mV vs 40 mV (Figure 4F), however, decreased significantly in plastic-song birds (0.10 ± 0.09, n = 45) and adult birds (0.09 ± 0.08, n = 38) as compared to subsong birds (0.17 ± 0.09, n = 40, p < 0.001 for both pairwise comparisons), suggesting a small developmental decrease in the relative contribution of AMPA vs NMDA receptors at LMAN-RA synapses during early development (Table 2). Interestingly, assuming a reversal potential of 0 mV for AMPA and NMDA currents, our results indicate an NMDA:AMPA ratio of 9:1 in subsong birds (‘Materials and methods’), consistent with a prior study (Stark and Perkel, 1999). Wilcoxon Rank–Sum Test: used when one or more of the distributions under comparison were significantly non-parametric, as determined by the Kolmogorov–Smirnov test. In contrast to significant developmental changes in the HVC drive to RA neurons (Figure 3F), the total input from LMAN to RA projection neurons did not show a significant change across the age categories we tested (Figure 4G). The average MAX LMAN current was 0.42 ± 0.21 nA (mean ± SD, n = 18 cells in five birds) in subsong birds, 0.48 ± 0.28 nA (n = 18 cells in seven birds) in plastic-song birds, and 0.38 ± 0.17 (n = 15 cells in five birds) in adults (p > 0.25 for all pairwise comparisons, Figure 4F). The ratio of MAX current to mean SF current suggests that the number of LMAN inputs to an RA cell is also largely unchanged across sensorimotor learning (p > 0.05 for all pairwise comparisons), remaining relatively sparse throughout (Figure 4H). In addition to changes in synaptic strength, learning and development have been shown to produce changes in the intrinsic excitability of neurons (Brons and Woody, 1980; Sourdet et al., 2003; Zhang and Linden, 2003; Zhang, 2004). As the song-related firing frequency of RA neurons increases throughout sensorimotor learning (Ölveczky et al., 2011), we sought to examine whether changes in the excitability of RA projection neurons in response to depolarizing input may contribute to such changes (Figure 5A). Intrinsic properties of RA projection neurons do not change significantly with song development. (A) To test intrinsic excitability of RA neurons as a function of age we injected current into RA cells and measured the membrane voltage in current clamp. (B) Membrane voltage in an RA projection neuron as a function of injected current. Example shown is from a 60 dph bird. (C) Average instantaneous firing frequency (IFF) throughout the 0.5-s current injection for the cell in B (n = 3 current sweeps). Traces correspond to differing intensities of injected current (−0.2–2 nA in increments of 0.2 nA). (D) Average IFF during the initial (FI) and final (FF) 5 ms of the current injection for the cell in B. (E) Spike frequency adaptation (FI/FF) in RA neurons for the three age categories as a function of stimulation intensity (n = 9 cells from subsong, 9 from plastic-song, and 10 from adult birds). (F) F-I curves for the same population of RA neurons as in E. p > 0.1 for all pairwise comparisons across age categories of the slope of the linear portion of the F-I curve. The recordings were performed in whole-cell current clamp at 35°C. This allowed us to capture the current-to-firing rate transformations in RA neurons with better control over leak currents and at more physiological temperatures, and hence higher instantaneous firing rates, than prior studies (Mooney, 1992; Kittelberger and Mooney, 1999). RA projection neurons were stimulated by injecting 0.5 s current pulses ranging in intensity from −200 pA to 2 nA in 200 pA steps (Figure 5B). Experiments were performed in parasagittal slices from subsong (n = 9 cells in two birds), plastic-song (n = 9 cells in two birds), and adult birds (n = 10 cells in two birds). We calculated the average instantaneous firing frequency (IFF) in response to three repeated current injections (Mooney, 1992; Kittelberger and Mooney, 1999) (Figure 5C). RA projection neurons showed marked spike-frequency adaptation that increased with increased current stimulation (Figure 5D,E, R = 0.97, p = 10−7, ‘Materials and methods’). The magnitude of adaptation (initial vs steady-state IFF) was similar across the different age groups (p > 0.05) for all pairwise comparisons at each stimulus intensity, a finding consistent with a previous study (Kittelberger and Mooney, 1999). The input/output gain of RA projection neurons, estimated from the linear part of the F-I curve, was also similar across the age groups, consistent with previous reports (Mooney, 1992; Kittelberger and Mooney, 1999). For current injections ≤1.4 nA, the average slope of the linear fit was 163.37 Hz/nA for subsong, 185.33 Hz/nA for plastic-song, and 201.50 Hz/nA for adult birds (R2 ≥ 0.99; Figure 5F). Though there was a trend towards a small increase in the overall gain from subsong birds to adults, this did not reach significance in our data set (p > 0.11). Additionally, IFF at a given stimulus intensity was not significantly different across age categories (Figure 5F, p > 0.05). Previous studies have shown that song development, and hence the reduction in vocal variability, is accompanied by a relative decrease in LMAN's premotor influence (Brainard and Doupe, 2000; Ölveczky et al., 2005; Aronov et al., 2008; Kao et al., 2008) in favor of an increased role for HVC (Aronov et al., 2008; Fee and Goldberg, 2011). But the intuitive circuit-level explanation—a learning-related increase in overall HVC drive to RA coupled with a decrease in LMAN input—was not observed. On the contrary, our results revealed that the LMAN input remains largely unchanged throughout song learning (Figure 4), while the overall HVC drive to RA actually decreases (Figure 3F). How to account for the developmental switch in premotor drive from LMAN to HVC in light of these results? One possibility is that the strengthening and pruning of HVC-RA connections makes LMAN inputs to RA less effective. To probe this idea further and, more generally, to examine the neural mechanisms that can regulate motor variability, we constructed a simple computational model of the HVC-RA-LMAN network (Figure 6A). We used this model to evaluate how song-related firing patterns of simulated RA neurons change when HVC-RA synapses are strengthened and pruned and how this process is impacted by other possible changes to the circuit, thus dissecting the potential contributions of various neural mechanisms to the regulation of motor variability. A simple model relates strengthening and pruning of connections in a motor control network (here: HVC-RA) to reduced motor variability. (A) Top: the early phase of song learning is characterized by high vocal variability (left panel). This is associated with relatively larger number of weaker inputs from HVC to RA neurons (middle panel). A simple model of this circuit organization (‘Materials and methods’), in which RA neurons integrate input from precise HVC time-keeper neurons and variable LMAN neurons, produces variable firing patterns in RA (right panel). Bottom: song learning is associated with a strengthening and pruning of HVC-RA connections and a concomitant decrease in song variability. Pruning the relative number of active HVC-RA inputs in our model while strengthening the remaining ones (middle panel) dramatically decreases the variability in song-related RA firing (right panel). The simulations of RA spike trains were done using model parameters consistent with our experimental data from age groups 2 (top, plastic song) and 3 (bottom, crystallized song), respectively. Note that the simulations for the two neurons are independent (i.e., the ‘older’ is not derived from strengthening and pruning connections of the ‘younger’). See ‘Materials and methods’ for further details. (B) The average cross-correlation (CC) between spike trains during different ‘song’ renditions of the simulated RA neuron increases with the degree of strengthening and pruning of HVC-RA synapses. The open circles correspond to the age groups 2 and 3 in our data set. Solid black line represents simulations using ‘standard’ model parameters chosen to conform to our experimental data (see ‘Results’, Figures 3–5, and ‘Materials and methods’). Dashed lines show simulations where inputs from HVC were either only strengthened (red) or pruned (blue), relative to the ‘standard’ model at age group 2. The x-axis (bottom labels) shows the fraction of active HVC inputs to RA (‘Materials and methods’), as well as the average strength of HVC inputs (top labels). (C–E) Effects on variability in RA firing from: (C) strengthening/weakening LMAN input by up to 50%, (D) changing NMDA:AMPA ratio at the LMAN-RA synapse, and (E) changing the gain (F-I relationship) of the RA neuron. All changes are relative to the ‘standard’ model (black lines) in ‘B’. (F–H) Effects on variability in RA firing stemming from changes to LMAN firing patterns. Changes are relative to the ‘standard’ model (black lines). (F) Different LMAN spike trains tested in our model (for 50 ‘song renditions’). Top: Poisson spike train. Middle: Poisson spike train with 30% of the spikes in the form of Poisson bursts (see ‘Materials and methods’). Bottom: time-varying Poisson firing. Blue curve shows the average instantaneous firing rate as a function of time in song with 50% modulation compared to the baseline rate. (G) Effect of altering the burstiness of LMAN neurons. Here, Poisson burst were added to the normal Poisson spike train. (H) Effect of increasing the song-locking of LMAN firing. The gradual strengthening and pruning of HVC inputs to RA in our model were parameterized to fit our experimental observations (Figures 3, 4; ‘Materials and methods’). In particular, we focused on changes that occur from plastic song to adult song, as variability in both song and RA firing patterns has been quantified and seen to decrease during this phase of learning (Ölveczky et al., 2011). The combination of strengthening and pruning HVC input to RA led to a dramatic reduction in LMAN's capacity to drive rendition-to-rendition variability in RA neurons (Figure 6A,B). Despite the simplicity of the model, these changes mirrored almost perfectly what has been observed in vivo (Ölveczky et al., 2011), meaning that the strengthening and pruning of HVC-RA synapses can, on their own, explain much of the learning-related reduction in song variability. Our simulations also showed that strengthening and pruning of HVC-RA connections is far more effective in reducing LMAN-induced variability in RA neurons than either strengthening or pruning on its own (Figure 6B), suggesting that the two processes act synergistically to reduce variability. While our experiments did not reveal any significant learning-related changes in LMAN inputs to RA, small modifications at this synapse, particularly early in learning, cannot be ruled out. To explore the consequences of such changes, we simulated both strengthening and weakening of LMAN inputs to RA relative to the ‘standard’ model derived from our measurements (Figure 6C, ‘Materials and methods’). When paired with the strengthening and pruning of HVC-RA connections, however, weakening LMAN input by as much as 50% explained less than 20% of the overall decrease in the rendition-to-rendition variability of RA firing. 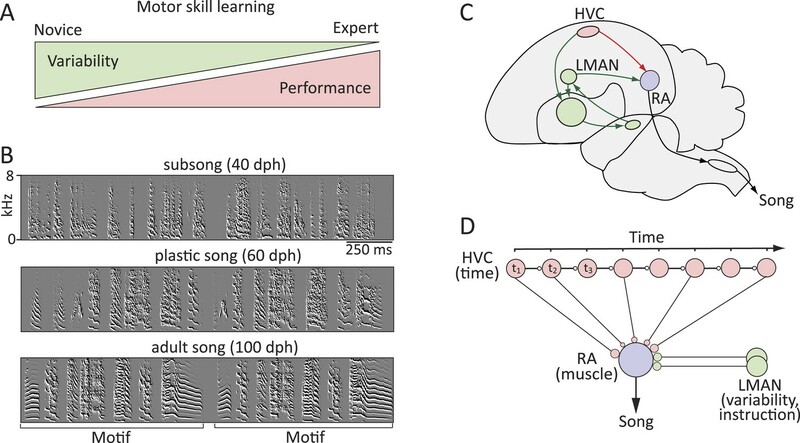 Thus age-related changes in LMAN-RA connectivity are unlikely to play a major role in reducing song variability during learning. Our results also suggested that the NMDA:AMPA ratio at LMAN-RA synapses increases modestly during early development (between subsong and plastic-song; Figure 4F). To probe whether changes in the receptor composition of LMAN-RA synapses impact LMAN's capacity to drive variability in RA, we ran simulations with different NMDA:AMPA ratios. Eliminating the AMPA component completely (100% NMDA) only decreased the variability in RA neurons by a few percent (Figure 6D). But even if a small fraction of the early reduction in vocal variability can be explained by a developmental decrease in AMPAR-mediated currents at the LMAN-RA synapse, this is not a plausible mechanism for reducing variability during later phases of sensorimotor learning (from plastic-song to adult) when receptor composition at the LMAN-RA synapses remains largely unchanged (Figure 4F). Though we did not find any major age-related differences in the intrinsic properties of RA projection neurons (Figure 5), there was a slight but non-significant trend towards a steeper F-I curve with age (∼10% steeper from subsong to plastic-song, and then again from plastic-song to adult birds, Figure 5F). Similar small changes in the gain of RA neurons, however, did not materially impact RA variability in our model (Figure 6E). Our simulations thus far assumed Poisson-like input from LMAN to RA (Figure 6F, top panel; ‘Materials and methods’), an approximation based on recordings from RA-projecting LMAN neurons in learning birds (Ölveczky et al., 2005). However, LMAN neurons are known to fire intermittent high-frequency bursts that may become more prominent in adults (Kao et al., 2008; Kojima et al., 2013). This raises the question of whether an age-related increase in the burstiness of RA-projecting LMAN neurons (Figure 6F, middle panel) could contribute to reducing vocal variability. Our simulations suggest that it does not; on the contrary, burstier LMAN spiking increases variability (Figure 6G; ‘Materials and methods’). While song-aligned firing patterns of identified RA-projecting LMAN neurons in juvenile birds (corresponding to age groups two and three in our experiments) show no significant rendition-to-rendition correlation (Ölveczky et al., 2005), recordings in older adults, albeit from unidentified LMAN neurons, show significant song-locking (Kao et al., 2008). Not surprisingly, our simulations showed that less random (i.e., more song-locked) LMAN firing yields less variable RA firing (Figure 6F [bottom panel] and Figure 6H). Whether there is indeed a learning-related increase in the song-locking of RA-projecting LMAN neurons still needs to be experimentally tested. Importantly, all our simulations showed that strengthening and pruning HVC input to RA decreases variability in RA firing irrespective of whether there are other concomitant changes in the circuit (Figure 3). Moreover, changes in HVC-RA connectivity could account for much, if not all, of the reduction in variability seen during song learning (Ölveczky et al., 2011). Though we cannot rule out that other mechanisms, including modifications to the spiking output of LMAN neurons (Figure 6F–H), LMAN-RA connectivity strength (Figure 6C), and the receptor composition at LMAN-RA synapses (Figure 6D), contribute to regulating variability, our results suggest that reorganization in HVC-RA connectivity is the dominant mechanism underlying learning-related reduction in vocal variability. We set out to identify neural circuit mechanisms that regulate motor variability during motor skill learning. We used zebra finches as a model system because they learn a complex motor sequence, show very significant reduction in song variability with learning (Ölveczky et al., 2005; Ravbar et al., 2012), and have separate but converging neural pathways for controlling learned aspects of song (VMP) and for driving vocal variability and plasticity (AFP) (Figure 1). Using whole-cell patch-clamp recordings in acute brain slices we interrogated how inputs from these distinct pathways to neurons in motor cortex analogue RA change during song development (Figure 2). We found that HVC inputs to RA neurons increase both in strength and number early in song learning, consistent with a developmental increase in HVC innervation of RA (Herrmann and Arnold, 1991). However, as learning proceeds and variability is further reduced (∼60–90 dph), there is a significant decrease in the number of HVC inputs and a strengthening of the remaining ones (Figure 3). Inputs from LMAN to RA, on the other hand, remain largely stable throughout sensorimotor learning, consistent with LMAN enabling and guiding song learning both in the juvenile and adult birds (Leonardo and Konishi, 1999; Tumer and Brainard, 2007) (Figure 4). While a previous study (Kittelberger and Mooney, 1999) showed the relationship between HVC fiber-stimulation and evoked EPSPs in RA projection neurons becoming steeper with age, the experiments were not designed to address the circuit-level changes that underlie this trend. Ours is the first study to elucidate the detailed logic of how inputs from both HVC and LMAN to RA neurons are modified during development. The results from our study are consistent with and complement previous structural and physiological studies (Herrmann and Arnold, 1991; Kittelberger and Mooney, 1999), and together provide a comprehensive view of the structural and functional changes in RA that accompany song learning. The degree to which these changes are driven by motor practice and learning vs genetically defined developmental programs cannot be easily parsed (Ölveczky and Gardner, 2011). Our results, however, establish a baseline against which the effect of targeted manipulations—behavioral, pharmacological, or otherwise—can be compared to further delineate the specific factors that contribute to synaptic and circuit-level changes in the developing song system. Our results also speak to the logic of connectivity within the song system. Because we recorded from RA neurons in slices where not all inputs from HVC and LMAN may have been faithfully preserved, the number of inputs we report (Figures 3G and 4H) should be seen as lower bounds. In these estimates each RA neuron receives, on average, an age-dependent 11–26 inputs from HVC and an age-independent 2–3 inputs from LMAN. The relative ratio of LMAN to HVC inputs is in agreement with structural studies, which found RA neurons to receive more synaptic contacts from HVC than from LMAN (Canady et al., 1988; Herrmann and Arnold, 1991). That there are more HVC than LMAN inputs to RA neurons is also consistent with the hypothesized function of these inputs. If the role of LMAN inputs is to ‘experiment’ on HVC-RA connections, as is widely assumed (Fiete et al., 2004), having each RA neuron receive only a few relatively strong inputs from LMAN ensures that single LMAN neurons can drive changes in RA firing and that the interference from different ‘experimenters’ is limited. Inputs from HVC, on the other hand, are required to drive on average 12 bursts per song motif in adult birds (Leonardo and Fee, 2005), and hence more HVC inputs may be needed. Whether RA bursts are driven by single HVC neurons, or whether multiple concurrent HVC inputs are required to trigger bursting in RA remains to be explored. The circuit-level changes that accompany song learning and the associated reduction in vocal variability were in many ways surprising and counterintuitive. Inputs to RA from LMAN, the main source of vocal variability in juvenile birds (Ölveczky et al., 2005, 2011), remain largely unchanged, while the overall input drive from HVC, which provides RA with the precise timing input that ultimately drives adult stereotyped song (Hahnloser et al., 2002; Long and Fee, 2008; Long et al., 2010), actually decrease with song development. We show that this decrease is driven entirely by the elimination of HVC inputs; remaining inputs from HVC continue to get stronger (Figure 3). Pruning connections from HVC to RA may serve to decrease the number of depolarizing events in RA neurons, thereby reducing RA neurons' sensitivity to LMAN input. This is because NMDARs, which dominate at the LMAN-RA synapse (Mooney and Konishi, 1991; Mooney, 1992; Stark and Perkel, 1999), require additional depolarizing input to be effective (Mayer et al., 1984; Jahr and Stevens, 1990). Thus if AMPAR-mediated HVC inputs to RA are being eliminated with learning (Figure 3G), such depolarizing events will become less frequent and thereby limit the times at which LMAN's can drive motor variability. 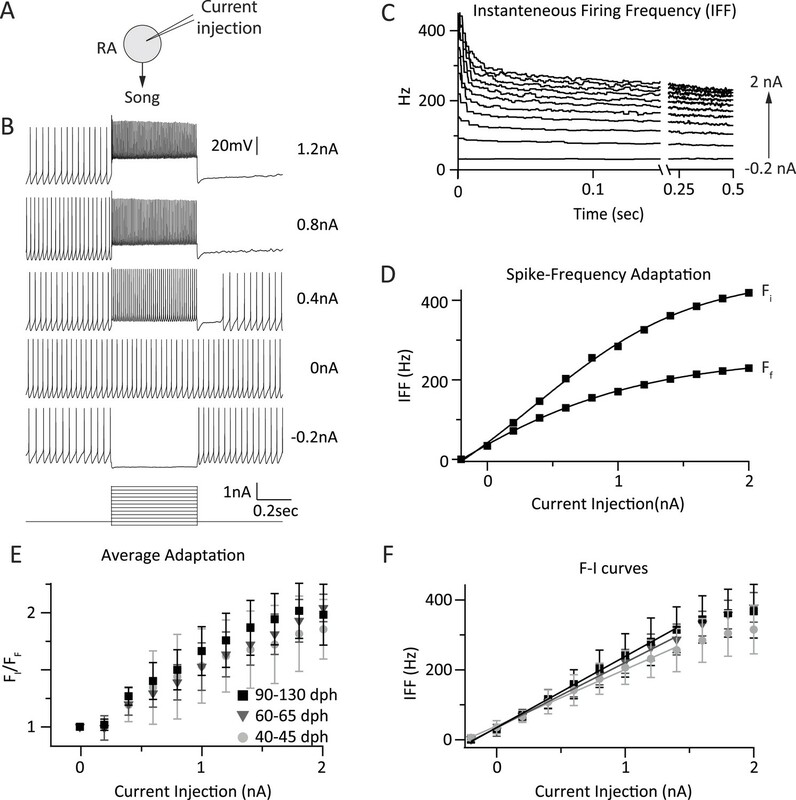 Increased hyperpolarization of RA projection neurons over the course of development (Ölveczky et al., 2011) could further curtail LMAN's capacity to drive spiking in RA neurons at times when there is no other depolarizing input. Strengthening individual HVC inputs to RA, on the other hand, could decrease LMAN's effectiveness by saturating RA neurons. During singing, RA projection neurons tend to fire bursts of spikes (Leonardo and Fee, 2005; Ölveczky et al., 2011), the instantaneous frequency of which increases with development (Ölveczky et al., 2011). This trend is likely driven, in part at least, by the increased strength of individual HVC inputs (Figure 3). Thus at times when RA neurons are released from hyperpolarization and NMDAR block, they will be increasingly saturated by their HVC input, thus reducing the capacity of LMAN to further modulate their firing. A simple model inspired by the HVC-RA-LMAN network (Figure 6) formalized the above intuition and showed that strengthening and pruning of action-specific connections in a motor control network, such as the VMP, reduces its sensitivity to external sources of variability (e.g., LMAN). Though strengthening and pruning can contribute independently, we found that the reduction in variability is accentuated when the processes co-occur (Figure 6B). Intriguingly, the reorganization of HVC-RA synapses we observed experimentally (Figure 3) was sufficient to explain the developmental decrease in motor variability seen in vivo (Ölveczky et al., 2011). We did not find any evidence that developmental changes in the strength or number of LMAN-RA connections contribute to this process (Figure 4). Yet even if there are modest changes, the effect on motor variability is likely to be small compared to those induced by changes at the HVC-RA synapse (Figure 6C). Furthermore, our simulations suggest that changes in HVC and LMAN input to RA are largely additive in terms of their effects on motor variability, suggesting independent mechanisms through which the song system can regulate variability. We also explored whether and how changes to the firing patterns of LMAN neurons may impact variability and found that increased burstiness increases rendition-by-rendition variability in RA (Figure 6G). Interestingly, female-directed ‘performance’ song, which is associated with less bursty LMAN firing (Kao et al., 2008), is significantly more stereotyped than undirected ‘practice’ song (Stepanek and Doupe, 2010). This suggests that modulating the burstiness of LMAN neurons, a basal ganglia-dependent process (Kojima et al., 2013), could be an effective mechanism for fast and context-dependent regulation of vocal variability. Another aspect of LMAN firing patterns that can impact song variability is the degree to which LMAN neurons are locked to song (Figure 6H). While activity of RA-projecting LMAN neurons in juvenile birds shows no significant rendition-to-rendition correlation (Ölveczky et al., 2005), recordings from non-identified LMAN neurons in adult birds have shown a relatively high degree of song-locking (Kao et al., 2008). How rendition-to-rendition variability in LMAN firing is regulated, and whether it contributes to learning-related changes in motor variability, remains to be explored. Though our simulations show that several circuit-level mechanisms may contribute to regulating motor variability (Figure 6), our experimental and modeling results taken together suggest that strengthening and pruning of HVC-RA connections is the dominant mechanism during song learning. A general mechanism for learning related reduction of motor variability? Learning-related changes in action-specific circuits, like the ones we describe (Figure 3), have been demonstrated also in the mammalian cortex (Silva et al., 2009; Xu et al., 2009; Wang et al., 2011; Caroni et al., 2012; Fu et al., 2012), raising the possibility that the mechanism for coupling motor variability and skill learning suggested by our experiments may apply more broadly, including to mammalian motor learning. Whether there is an LMAN-equivalent in mammals, or how exploratory variability is induced and regulated in mammalian motor control circuits more generally, remains to be explored. But regardless of whether the source of motor variability is intrinsic neural noise or a dedicated LMAN-equivalent input, our simulations suggest that learning-related strengthening and pruning of action-specific connections in motor control circuitry is, under the assumptions of our model, sufficient to ensure reduction in motor variability (Figure 6). Having the source of variability in motor control networks be mediated predominantly via NMDARs, as in songbirds, makes the variability in these circuits (e.g., RA) more sensitive to the learning-related reorganization of their connectivity (Figure 6D). Inducing variability through NMDARs also ensures that the resulting motor exploration is focused on instances when there are other depolarizing inputs to the neuron, that is, when there are active connections in the control network that can be experimented with and modified. Having learning-related reorganization of action-specific connections regulate motor variability lends considerable flexibility to the process of motor skill learning. Consider the case of learning multiple actions (e.g., syllables in a song). Assuming that learning an action leads to synaptic strengthening and pruning in the neuronal assemblies that encode and control that action (Xu et al., 2009; Wang et al., 2011; Fu et al., 2012), then, in the absence of other mechanisms limiting plasticity, the network should retain its native capacity to learn new actions as long as those are not contingent on network connections associated with already acquired ones. In the songbird system, a tight correspondence between specific actions (i.e., syllables) and HVC-RA connections is assured, since one HVC neuron only contributes to one time-point in the song (Hahnloser et al., 2002). A specific prediction from this conceptual model as it relates to birdsong is that syllables that have not yet been fully formed (i.e., ones still far from matching the ‘template’) should be more influenced by LMAN, and hence be more variable, than syllables that are already a close match. Intriguingly, this is exactly what was reported in a recent study (Ravbar et al., 2012). The authors found a strong correlation between the distance of a syllable from its target and its variability. Thus the variability of two actions (syllables) was a function of how well they had been learned. The mechanism we propose for regulating the effect of LMAN provides a simple circuit-level explanation for this observation. The circuit-level changes we observed during song development may impact the capacity for learning beyond reducing exploratory variability. Since HVC-RA connections are a likely substrate for song learning, having an abundance of these connections, as is the case during the height of sensorimotor learning (Figure 3G), means that the learning system has a relatively large number of connections to explore and modify. But as the system ‘learns’ which HVC inputs to strengthen and which to eliminate, the number of connections decreases, thus also shrinking the substrate for plasticity and learning, making the acquired behavior more robust to change. This general motif of initial hyper-innervation, followed by synaptic strengthening and pruning is also seen in other developing circuits, including the mammalian cortex (Huttenlocher, 1979; Rakic et al., 1994; Katz and Shatz, 1996; Hashimoto and Kano, 2003; Walsh and Lichtman, 2003). In summary, our study characterized circuit-level changes that accompany song development and identified a simple, general, and adaptive mechanism for coupling motor skill learning and variability in a way that does not compromise the capacity for future learning and plasticity in motor control circuits. This offers a circuit-level explanation for one of the most ubiquitous features of motor skill learning, namely the action-specific and learning-related reduction in motor variability. The 124 male zebra finches (Taeniopygia guttata) used for this study were obtained from our breeding colony. The care and experimental manipulation of the animals were carried out in accordance with guidelines of the National Institutes of Health and were reviewed and approved by the Harvard Institutional Animal Care and Use Committee. Since our aim was to characterize how inputs to RA change as a function of sensorimotor learning, which in zebra finches takes place between ∼35–90 dph (Immelmann, 1969), we focused our experiments on birds in this age range. Our experimental subjects were divided into three age groups corresponding to three distinct stages of song learning: (i) subsong juveniles (40–45 dph), (ii) plastic-song juveniles (60–65 dph), and (iii) crystallized-song adults (90–130 dph). Birds, kept on a 14-/10-hr light/dark cycle, were brought up from the aviary on the day of the experiment, anesthetized with isoflurane and subsequently decapitated. Brains were harvested and placed in 4°C oxygenated (bubbled with 0.4 liters per minute 95% O2/5% CO2) artificial cerebrospinal fluid (ACSF) containing (in mM) 119 NaCl, 2.5 KCl, 1.3 MgCl2, 0.5 CaCl2, 1 NaH2PO4, 26.2 NaHCO3, 11 D-glucose, in which equimolar choline chloride replaced NaCl to limit excitotoxicity. Osmolarity of all ACSF solutions was elevated to 350 mOsm with sucrose (Bottjer, 2005). All reagents were purchased from Sigma–Aldrich (St. Louis, MO). Experiments were performed in 300 μm thick acute brain slices (Mooney and Konishi, 1991) cut using a vibrating microtome (Leica VT1000 S, Germany). For experiments characterizing HVC inputs to RA, parasagittal slices were sectioned at a 26° angle relative to the interhemispheric fissure by cutting the brain down the midline and gluing each hemisphere to platforms angled at 26° with the dorsal surface facing down. We found that this slice preserves more HVC inputs to RA than the straight parasagittal slice, yielding larger HVC fiber stimulation-evoked MAX currents. The slice containing the largest fraction of RA (diameter of nucleus in the cut plane >600 µm) and HVC afferent fibers, as judged visually through an IR-DIC microscope (Figure 2A), was used. For experiments characterizing LMAN inputs to RA, the optic tecta and brain stem were removed, and the hemispheres laid flat on their ventral surface. The brain was then cut in half along the coronal plane and the posterior half glued onto its freshly cut anterior face and sectioned. 300 μm coronal slices were cut and the one containing the largest fraction of RA (diameter of nucleus in the cut plane >400 µm) and afferent fibers from LMAN was used. After cutting, slices were transferred to a chamber containing ACSF at 37°C, in which 50% of the NaCl was replaced with choline chloride. The slices were allowed to recover for 30 min, before being transferred to ACSF without choline chloride for an additional 30+ minutes before experiments commenced. Solutions in both chambers were allowed to cool to room temperature (20–23°C). Whole-cell electrophysiological recordings in RA were performed under IR-DIC visual guidance. Voltage-clamp recordings were carried out at room temperature (20–23°C) using electrodes of 2.5–3.5 MΩ resistance, filled with an internal solution containing (in mM): 35 CsF, 100 CsCl, 10 EGTA, and 10 HEPES, with pH adjusted to 7.32 with CsOH. 50 μM picrotoxin was added to the external solution to block fast feed-forward GABAergic inhibition (Kittelberger and Mooney, 1999; Stark and Perkel, 1999). Extracellular divalents (both Mg2+ and Ca2+) were elevated to 4 mM in order to dampen excitability and reduce spontaneous activity. HVC-evoked EPSCs were recorded at −70 mV in order to minimize contamination from predominantly NMDAR-mediated LMAN inputs (Mooney and Konishi, 1991; Mooney, 1992; Stark and Perkel, 1999) by means of hyperpolarization induced Mg2+ block. LMAN-evoked EPSCs were recorded at +40 mV in addition to −70 mV in order to characterize both NMDA and AMPA receptor mediated components (Figure 4B). Current-clamp recordings were carried out at 35°C (TC-324B, Warner Instruments, Hamden, CT) with 2.5–3.5 MΩ electrodes containing (in mM): 130 K-Gluconate, 0.2 EGTA, 4 KCl, 2 NaCl, 10 HEPES, 2 Mg-ATP and 0.5 Na-GTP, with pH adjusted to 7.25 with KOH. RA projection neurons were identified based on their spontaneous tonic activity and characteristic spike waveform recorded in cell-attached configuration prior to breaking into the cell (Mooney, 1992; Spiro et al., 1999). The data presented are from identified projection neurons. Electrophysiological data were recorded with a MultiClamp 700B (Molecular Devices, Sunnyvale, CA) using mafPC software (courtesy of MA Xu-Friedman) and custom macros in Igor Pro (WaveMetrics, Portland, OR). Signals were digitized at 100 kHz and Bessel filtered at 10 kHz. Input resistance was measured throughout the experiment in response to a 10 ms long 10 mV hyperpolarization step. Series resistance was not compensated, but was monitored throughout the recording, and not allowed to vary by more than 10%. If it did, the cell was excluded from the analysis. Inputs were stimulated either with a pair of saline-filled glass electrodes (Figure 2A) or a pair of tungsten electrodes (MicroProbes, Gaithersburg, MD) selected from an array of four evenly spaced electrodes. Using the array allowed us to switch the electrodes across which stimulation was delivered and thus activate different parts of the fiber tract independently without moving the electrodes and risk losing the cell. Stimulation currents were delivered using an ISO-Flex Stimulator (A.M.P.I., Israel). The current pulse was 0.2 ms in width and varied in amplitude (see below). HVC and LMAN afferent fibers enter RA along different tracts, allowing isolated activation of these inputs to RA (Mooney and Konishi, 1991). For HVC experiments the stimulating electrodes were placed ∼1 mm dorsal to RA on the fiber tract connecting HVC to RA (tractus archistriatalis) (Figure 2A). For LMAN experiments, the stimulating electrodes were placed ∼1 mm lateral to RA along the fiber tract connecting LMAN and RA (Stark and Perkel, 1999). The stimulus intensity was gradually increased from 10 μA to 1 mA. At the lowest intensities no current was typically evoked, but as stimulation intensity increased, the evoked postsynaptic currents (EPSCs) also increased in amplitude, until reaching a maximum (Figure 2C,D). Currents were included only if they showed a smooth rise to peak indicative of monosynaptic input. For current-clamp recordings, cells were stimulated with a 0.5 s direct current injection at intensities ranging from −200 to 2000 pA (Figure 5B). The recorded current traces were smoothed using a 1 ms sliding window. The threshold for detecting a unitary EPSC single fiber (SF) input was two times the RMS of the signal acquired without any stimulation. The RMS (or ‘noise’) of our recordings was 2–5 pA, meaning that SF currents <4 pA were not registered. SF currents were measured at a minimal stimulus intensity that produced 25–75% failures (a pre-set criteria) relative to EPSCs of consistent amplitude. The SF was defined as the average peak EPSC (N > 3) evoked at that minimal stimulus intensity (Figure 3B). In 107 out of 264 recorded projection neurons, we were able to measure up to three SFs by stimulating across different neighboring stimulus–electrode pairs of the 4-electrode array. If two SF currents measurements were made in the same cell by stimulating contiguous pairs of stimulation electrodes, the second observation was only included if the evoked currents in the two cases differed significantly in peak amplitude (p < 0.05, Student's t test). MAX currents were characterized at the stimulus intensity (MAX-stim) where the EPSC peak amplitude no longer increased despite a greater than threefold increase in stimulus intensity (Figures 2E and 4B). MAX current was the average peak response evoked at MAX-stim (N > 3; CV ≤ 0.2). MAX currents were recorded by stimulating across the electrode pair that evoked the largest EPSC. The relative number of inputs to a cell (Figures 3G and 4G) was estimated from the ratio of the MAX current of a cell to the mean SF current for the given age-category. This calculation assumes that inputs to RA neurons sum linearly, and that the average SF input to an RA neuron can be estimated from the average SF current across the population of cells at the given age. An alternative method for approximating the number of inputs to a cell originally introduced to quantify number of inputs at the retinogeniculate synapse (Hooks and Chen, 2006), uses the SF current(s) recorded in a cell as the estimate of mean input strength. The fiber fraction (SF current/MAX current) for each input can then be estimated and averaged across the SFs in an age group to get the mean fiber fraction. The inverse of this quantity provides an alternative estimate for the number of inputs to cells in a given age group. We note that the two estimates yield very similar numbers. Estimating the number of HVC inputs using the mean SF current across the population as a proxy for any given cell's mean input, that is, the method we use for reporting the number of inputs in the text, yields 19, 26, and 11 inputs for age groups 1, 2, and 3 respectively, whereas the original method using fiber fractions (Hooks and Chen, 2006) yields 19, 28, and 8 inputs. Importantly, these numbers represent lower bounds on the average number of inputs to a cell at a given age. F-I curves were generated by calculating the instantaneous firing frequency (IFF) evoked by 0.5 s long direct current injections, ranging from −200 pA to 2 nA in 200 pA steps (Figure 5B) (McCormick et al., 1985). Current injections were 30 s apart and the sweep from −200 pA to 2 nA repeated three times. The IFFs for a given current injection were then averaged for each cell (Figure 5C). Spike-frequency adaptation was characterized both in terms of magnitude, by comparing the average IFF during the first and last 5 ms of the stimulus for each cell (Figure 5D), and kinetics, by fitting a single exponential to the first 100 ms of the decay of the average IFF curve at each stimulus intensity for each cell. SF data did not follow a normal distribution, as determined by the Kolmogorov–Smirnov test. For these distributions statistical significance was assessed using the non-parametric Mann–Whitney–Wilcoxon test. Box and whisker plots are shown as medians (white lines), with 25th to 75th percentile range boxes and 10th and 90th percentile whiskers. The other data were normally distributed (K–S test) and differences across age groups were tested using the parametric Student's t test. Statistical significance is indicated on graphs: *p < 0.05; **p < 0.01; ***p < 0.001. If nothing is indicated on the graphs, p > 0.05. Values reported are mean ± SD, unless otherwise noted. We estimated the parameters of the log-normal distribution for each of the three age groups separately (Figure 3), according to the above equations. We constructed a simple feed-forward version of a prior network model of the HVC-RA-LMAN circuit (Fiete et al., 2007) with the aim of identifying general mechanisms that contribute to regulating motor variability as a function of learning and development (Figure 5A). At the top of our hierarchical model is the timekeeper circuit (HVC), with neurons active only once during the ‘song’ (Hahnloser et al., 2002). These neurons, which produce the same pattern of activity on each rendition, project downstream to muscle-related neurons that drive the behavior (RA). Variability is introduced at the level of RA by an external source of variable input (LMAN). where τm = 20 ms is the membrane time constant, VR = −70 mV is the resting membrane potential, IHVC is the excitatory input from HVC neurons, ILMAN is the excitatory input from LMAN, and VINH is the tonic inhibitory input. R = 260 MΩ is the input resistance of the RA neuron. Note that we measured the input resistance to be around 130 MΩ (Table 1), but to allow for two HVC inputs at any given time point in the song and to compensate for possible loss of HVC and LMAN inputs in our slice recordings, we multiplied this by a factor of two. The qualitative results we obtained, however, were not sensitive to this choice. If the membrane potential V reaches a threshold Vth = −50 mV an RA spike is triggered and V is subsequently reset to VR. The membrane potential V remains clamped at VR for a refractory period of 1.5 ms, after which it resumes its dynamics according to the above equation. There are NHVC = 100 HVC neurons in the model. Each HVC neuron produces a single burst of spikes in the 1000 ms long ‘song motif’. The duration of each burst is 10 ms consisting of five spikes 2 ms apart. The onset of the burst of the i -th HVC neuron is (i − 1) × 10 ms from the beginning of the song, such that the HVC bursts tile the whole interval of the song regularly and in a non-overlapping fashion. where τs = 5 ms is the synaptic time constant, WiHVC is the strength (peak EPSC) of the synapse from the i -th HVC neuron to the RA neuron, and tji is the time of the j -th spike produced by the i -th HVC neuron. where [Mg] = 0.5 mM is the intracellular Mg2+ concentration. The total input from LMAN to the RA neuron is ILMAN=ILMANAMPA+ILMANNMDA. Unless otherwise noted (see below and Figure 6D) we assumed 90% NMDA and 10% AMPA at the LMAN-RA synapse (Stark and Perkel, 1999). where m is the mean HVC-RA connection strength, ρ is the ratio of active HVC-RA input (see below) and RINH = 800 MΩ is the ‘inhibitory input resistance’, that is, the proportionality constant determining the amount of inhibition as a function of HVC input. Its high value reflects the fact that VINH represents the inhibitory counterpart of 100 excitatory HVC inputs. With the above set of parameters, the firing rate of the RA neuron is maintained at around 50 Hz given the HVC-RA connectivity profile specified below, which is consistent with in vivo recordings (Ölveczky et al., 2011). The strengths of inputs from HVC to RA are drawn from a log-normal distribution as suggested by our experimental results (Figure 3B). In order to probe age-related strengthening (Figure 6B), the mean and standard deviation of the distribution were linearly inter- and extrapolated between the values observed for our second and third age groups. We also pruned the HVC inputs by a fraction of 1 − ρ (i.e., their corresponding WiHVC values are set to zero) as suggested by our experimental results. In order to probe age-related pruning, we linearly changed ρ from 1 to 0.2 along with changes in HVC-RA synaptic distribution (Figure 6B). The changes in the parameters of input strength distribution and pruning were aligned such that the points ρ = 0.9 and ρ = 0.37 (Figure 6B, open circles) represent the connectivity profile measured in our second and third experimental groups, respectively, that is, a 2.4-fold decrease in the number of active inputs, and an increase in mean input strength from 50 pA to 70 pA, with the standard deviation concomitantly changing from 35 pA to 70 pA.
where gAMPA is the peak conductance of the AMPAR mediated component, gNMDA the peak conductance of the NMDAR mediated component, and E the reversal potential of the excitatory synapse. Assuming E = 0 mV, our data (Figure 4F) results in r=gAMPAgAMPA+gNMDA=0.09 in age group 1 and r = 0.06 in age groups two and three. To probe how changes in relative receptor composition may affect RA spike patterns, we varied r in the range of 0–0.2 and, in addition, simulated pure AMPAR input (Figure 6D). The slope of the F-I curve of our model leaky integrate-and-fire neuron is proportional to 1/(τm Vth). Our recordings revealed a slight developmental increase in the slope of the F-I curve of RA neurons (Figure 5F). To address the effect that such changes may have on the firing patterns of RA neurons, we altered the membrane time constant of the integrate-and-fire model neuron in the range of τm = 16 − 25 ms (Figure 6E). This corresponds to ±20% change in the slope of the F-I curve of the neuron, compared to the τm = 20 ms case. To explore how burstiness in LMAN neurons influences variability in RA neurons, we added Poisson bursts to LMAN spike trains while keeping the rate of the LMAN firing fixed at 40 Hz (Figure 6F, middle panel, Figure 6G). The onsets of these bursts were themselves modeled as a Poisson point process, and each individual burst event was composed of a stereotypical pattern of 5 spikes, 2 ms apart (i.e., the duration of each burst was 10 ms). Therefore, in order to generate LMAN spikes trains with the rate of 40 Hz and fraction b of the spikes in bursts, the rate of the tonic Poisson spikes was set to 40(1 − b) Hz, and the rate of burst events was set to (40 b/# spikes per burst) = 8b Hz. To explore the extent to which song-locking of LMAN firing influences variability in RA, we modulated the rate of the Poisson spike trains with a single sine wave profile along the 1000 ms interval of simulation (Figure 6F, lower panel, Figure 6H). All the simulation results in Figure 6 were obtained by averaging 5000 realizations of the network with the given parameters. The time constant of integration in the simulations was 0.2 ms.
where the averaging 〈.〉t is performed over the length of renditions (1000 ms), N is the number of renditions and ri¯(t) is the mean-subtracted version of ri(t). For the simulations in Figure 6, the number of renditions, N, was 200. Journal of Applied Physiology 101:1776–1782. Proceedings of the National Academy of Sciences of USA 106:12518–12523. What can we learn from synaptic weight distributions? Advances in Neural Information Processing Systems 7:101–108. In: RA Hinde, editors. Bird Vocalizations. Cambridge University Press. pp. 61–74. The Journal of Neuroscience 19:6037–6057. The Journal of Neuroscience 10:3178–3182. The Journal of Neuroscience 28:13232–13247. Proceedings of the National Academy of Sciences of USA 110:4756–4761. The Journal of the Acoustical Society of America 105:1455–1468. Current Opinion in Neurobiology 19:654–660. Proceedings of the National Academy of Sciences 88:4075–4079. Current Opinion in Neurobiology 21:124–131. Frontiers in Computational Neuroscience 7:111. Journal of Comparative Psychology 93:260–277. In: MA Corner, FH Lopes da Silva, IBM Uylings, J van Pelt, editors. Progress in Brain Research. Elsevier. pp. 227–243. The Journal of Neuroscience 32:3422–3432. Annual Review of Neuroscience 23:393–415. The Journal of Neuroscience 10:1541–1556. The Journal of Neuroscience 23:10238–10248. Journal of Comparative Neurology 309:486–494. Proceedings of the National Academy of Sciences of USA 108:2545–2550. Thank you for choosing to send your work entitled “A neural circuit mechanism for regulating motor variability during skill learning” for consideration at eLife. Your full submission has been evaluated by Eve Marder (Senior editor) and 3 peer reviewers, one of whom, Ronald L Calabrese, is a member of our Board of Reviewing Editors. The decision was reached after discussions between the reviewers. We regret to inform you that your work will not be considered further for publication at this stage. The authors present an electrophysiological analysis of how connectivity between HVC and RA and LMAN and RA change during the period of song acquisition and consolidation in zebra finch. They use this model to address the general issue of how motor performance and variability interact so that during acquisition variability, which is essential for learning a new skill, is reduced as performance is enhanced. The system is particularly suitable for such analyses because variability generating (LMAN) inputs and the inputs that drive learned song (HVC) separately project to the premotor area (RA). They conclude that there is no change in the variability generating inputs (LMAN) but that the song generating inputs are pruned and strengthened during song acquisition and consolidation. They then present a simple model that shows how such a system leads to increased performance and show how NMDA inputs from the variability system enhance this process. There are several major concerns voiced by the expert reviewers that weaken enthusiasm for the paper. First and foremost is the question of novelty. The Kittelberger, J.M., and Mooney, R. (1999) study comes to much the same conclusions about the development progression of HVC inputs to RA, albeit with less elegant electrophysiological methods. RA neuronal intrinsic properties, were also characterized by Kittelberger, J.M., and Mooney, R. (1999). How LMAN inputs to RA progress during development has not been described and represents a significant innovation in this study. The reviewers have concerns that this part of the study is not adequately documented in the data so that statistical tests are meaningful. Considerable new experimental measurements would have to be made to satisfy this criticism. Another innovation of the present study is the modeling effort, but all the reviewers are concerned that this is not well developed or described, being more of an afterthought in the Discussion. Substantial amplification of the modeling effort (to explore whether the stated results are robust to the variability in synaptic strength demonstrated in the first part of the paper, to potential age-dependent changes in the strength of LMAN inputs, time-varying LMAN rates, etc.) would be needed to satisfy this concern. It is eLife's policy to not move papers forward when they would need substantial new work to meet reviewers' concerns. In this case, it is our estimate that the amount of new work required would exceed the limits of what eLife considers appropriate for a revision. 2) The model should be presented in Results and more thoroughly described. 3) Please make clear why the NMDA components of HVC inputs to RA was not investigated. Is there no NMDA component at these synapses? 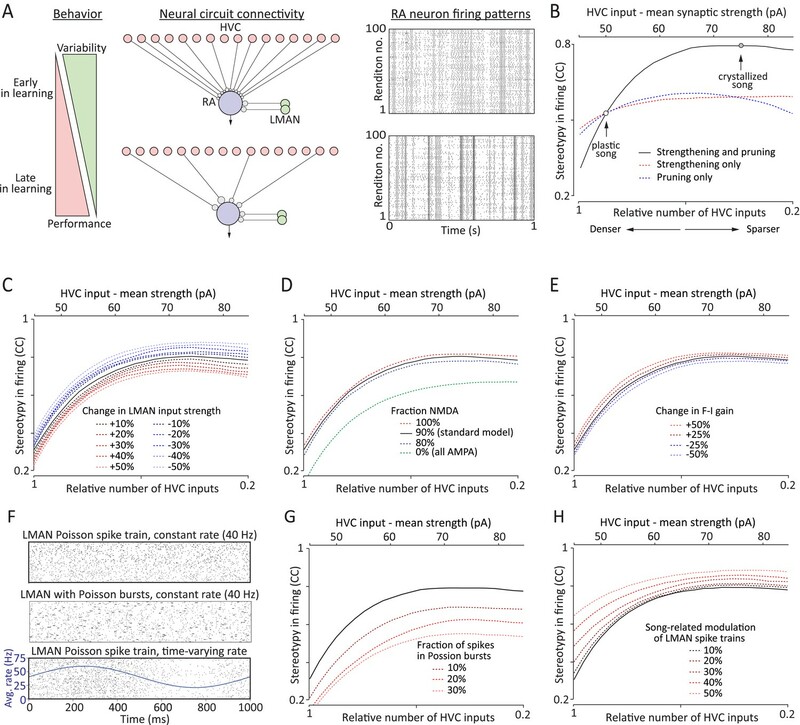 The authors convincingly demonstrate an age-dependent change in the strength of HVC inputs to RA and use a simple mathematical model of RA neurons and their inputs to explore the consequences of these changes for motor variability. The results are interesting and the writing is very clear; however I think that several significant issues must be addressed before the paper is acceptable for publication. 1) Figure 3 convincingly demonstrates significant age-dependent changes in the strength of HVC-to-RA connections. However, two other key claims made by the authors—the apparent lack of such changes in LMAN-to-RA synapses shown in Figure 4 and the claim that the intrinsic properties of RA neurons do not change, supported by data in Figure 5E and 5F—are based on the absence of a statistically significant effect. Although claims about changes in neural/synaptic populations must necessarily be made based on a limited sampling of neurons, I am concerned by the fact that the non-significant findings (Figures 4, 5E, F) are based on smaller datasets than the reported significant finding (Figure 3). For example, total number of data points shown in Figure 3B (72+60+120=252) is more than twice as great as those in Figure 4C (40+45+38=123). Is the failure to detect a significant difference in the LMAN-RA synapses simply a result of the authors collecting less data than they obtained for HVC-RA synapses? Of even more concern is the argument based on the data shown in Figure 5E, F. As the authors acknowledge, there is a trend towards an age-dependent effect which does not reach significance, however the total number of data points is small (n=9-10 for each condition); I am therefore not convinced that no age-dependent trend exists. This issue might be addressed in two different ways (ideally in both). First, the authors could devise an analysis to demonstrate that the difference between the LMAN-RA and HVC-RA results is not an artifact of dataset size. Second, the authors could expand their modeling approach to demonstrate that their argument about the consequences of changes in HVC-RA synapses holds true, even if the (small, and in the present analysis not statistically significant) changes in LMAN-RA connectivity and intrinsic RA properties hinted at in Figures 4 and 5 were in fact present. 2) The authors compute the relative number of synaptic inputs using a statistic based on that used by Hooks and Chen (2006). However there are several important (and potentially problematic) differences between that earlier analysis and the one used here. Hooks and Chen calculated the ratio of single fiber current divided by the maximum current (SF/MAX), whereas the authors of the paper under review compute the reciprocal of this quantity (MAX/SF). Hooks and Chen's approach prevents large biases from low single fiber currents that would make the MAX/SF ratio quite large. After averaging this ratio for all measured single fibers, Hooks and Chen then invert it to estimate relative number. Importantly, Hooks and Chen calculate this statistic for each measured single fiber current ‘individually’, whereas the paper under review takes every maximum current and divides it by the ‘average’ single fiber current for that age group. It seems like SF/MAX should first be calculated for each single fiber input, as in Hooks and Chen, and then averaged. Moreover, the distributions shown in Figures 3B and 4C are skewed to the right, making the mean a poor choice for calculating the relative number. Additionally, as many readers will not be familiar with this analysis technique the pros and cons of this approach should be discussed in greater detail to clarify the underlying assumptions. 3) The modeling section should be expanded and moved from the Discussion into the Results section. In the current study, LMAN input is modeled as a single Poisson input with a fixed rate, although the firing rate of LMAN neurons, while variable, is modulated over the course of a motif. Are the conclusions based on the model robust to RA neurons receiving multiple, time varying inputs from LMAN? I suspect that the answer is yes; however demonstrating this would make the model results more convincing. Also, it is surprising that the authors do not parameterize their model with the distribution of single-fiber synaptic strengths presented in the first part of the paper (the fact that model inputs are expressed in units of mV makes it hard to assess whether the model distribution is similar to the distribution observed experimentally). Would the key model results hold true using a more realistic distribution of input strengths? Performance variability can facilitate motor learning and often declines as a skill is perfected. The neural mechanisms that account for this transition from high to low performance variability as a skill is acquired are not well understood. Here the authors addressed this issue by studying developmental changes in synaptic inputs onto song motor (RA) neurons from two different sources: HVC, a song premotor nucleus that provides precise timing signals for song patterning; and LMAN, another premotor nucleus that is thought to function as a “noise” source to drive song variability necessary to song learning. The authors make whole cell recordings from RA neurons in brain slices from male zebra finches at three canonical time points during song learning, and electrically stimulate either HVC or LMAN axons to measure the strength of single fiber (SF) inputs and also to estimate the (relative) maximum (MAX) numbers of synapses from each of these sources. Using these approaches, they determine that HVC synapses become stronger and relatively less abundant over song learning, whereas LMAN inputs remain stable in strength and relative numbers; they also show that the intrinsic properties of RA neurons are also stable over this period. They then provide a simple circuit model that supports the idea that differences in how HVC and LMAN synapses onto RA neurons change with development could account for the decrease in song variability that accompanies song learning. Overall, the experiments are well done and the manuscript is clearly written. The two major concerns relate to relative novelty and the degree to which the proposed circuit mechanism was tested. Regarding novelty: prior anatomical and physiological studies have documented changes in the relative strength and numbers of HVC synapses on RA neurons over song learning in zebra finches, and also had characterized the intrinsic properties of RA neurons over a similar time course. Thus, the characterization of LMAN synapses on RA neurons over song learning is the novel experimental data set provided here; the modeling study is also novel. Whether these together provide enough of an advance and will appeal to a broader readership is hard for me to assess. As a songbird researcher, I find the results very interesting and they help to articulate how the consolidation of HVC synapses on RA neurons could act as a counterweight to suppress noise from LMAN inputs. I would be interested to hear what the other reviewers' thoughts are about this. Regarding mechanism-testing: the adult songbird's capacity to re-engage vocal plasticity and variability mechanisms through deafening or other perturbations of auditory feedback could more directly test the idea that the relative strength of HVC synapses is the major regulator of LMAN's ability to influence song variability. Whether the authors are still in a place to execute any more slice experiments is unknown, but an additional manipulation of this sort would strengthen support for their conclusions. Thank you for sending your work entitled “A neural circuit mechanism for regulating motor variability during skill learning” for consideration at eLife. Your article has been favorably evaluated by Eve Marder (Senior editor) and 3 reviewers, one of whom is a member of our Board of Reviewing Editors. The following individuals responsible for the peer review of your submission have agreed to reveal their identity: Ronald L Calabrese (BRE), Richard Mooney, (reviewer), and Samuel Sober (reviewer). The authors present a thorough electrophysiological analysis of how connectivity between HVC and RA and LMAN and RA change during the period of song acquisition and consolidation in zebra finch. They use this model to address the general issue of how motor performance and variability interact so that during acquisition variability, which is essential for learning a new skill, is reduced as performance is enhanced. The system is particularly suitable for such analyses because variability generating (LMAN) inputs and the inputs that drive learned song (HVC) separately project to the premotor area (RA). They conclude that there is no change in the variability generating inputs (LMAN) but that the song generating inputs are pruned and strengthened during song acquisition and consolidation. They then present a simple model of the system that reflects the changes in HVC and LMAN inputs to RA projection neurons observed during song maturation (learning). This model is carefully described and appropriate to the question at hand. The model is systematically explored and the modeling data supports their major conclusion that strengthening and pruning of HVC RA connections is the dominant mechanism that leads to decreased variability in performance and suggests how NMDA inputs from the viability system may enhance this process. The paper is in general well written and clear, and the Methods are sufficiently detailed. The illustrations are clear and show all relevant data. The experiments are careful and the data convincing. The Discussion is illuminating and sets the work in a general context of motor learning that should be broadly interesting to the readers of eLife. Detailed critiques by the expert reviewers include several points, which should be addressed by the authors in revision, but which do not require further experiments. 1) The expanded modeling results greatly strengthen the authors' argument, however I think the presentation could be made a bit more clear. First, in Figure 6C–E, the accompanying legend, and the text in Results, I suggest that the authors more explicitly specify the baseline value relative to which the changes in LMAN input, FI gain, etc. are performed. For example, the legend to Figure 4D reads: “…(c) strengthening/weakening LMAN inputs by up to 50%”. This should specify: “… up to 50% relative to the default value of W_LMAN, which was based on our empirical measurements of single-fiber currents (see Results; Figure 4E)”. Doesn't need to be this exact text of course, but for all parameters varied in Figure 6 this type of information should be made more explicit. Also, if I'm reading Figure 6 correctly, the black lines in 6C–E, G and H all represent the “default” model, this should also perhaps be made explicit in the legend. Finally, the lightest red dashed lines are nearly invisible in 6G and H. Perhaps these could be darkened to enhance readability. 2) In the Discussion section the authors consider how elimination and strengthening of HVC inputs to RA could separately contribute to a reduction of sensitivity to LMAN drive. However, the modeling studies never dissociate these two variables (number vs strength of HVC inputs), although it seems that the authors are in a good position to do so. This section of the Discussion is therefore somewhat unsatisfying and highlights that the authors have not performed an important variation on their analysis that could yield additional insight. I think that the authors should either explore this directly using the model (by dissociating input sparsity from input strength to back up their qualitative assertions) or remove this consideration from the Discussion. I thoroughly enjoyed reading the greatly improved manuscript and the authors' response to the reviewers' comments, which largely addressed my concerns. This is an important study that goes to significant lengths to describe a developmental change in functional connectivity that could account for how motor variability decreases with skill learning. Overall, I believe that the study will appeal to a wide audience and serve as an extremely useful resource for those interested in neural mechanisms of motor variability and learning. 1) I was left to wonder whether the NMDA EPSC time course (i.e., decay kinetics) measured for LMAN inputs onto RA neurons are able to contribute to variability in RA neuronal firing in response to drive from HVC? 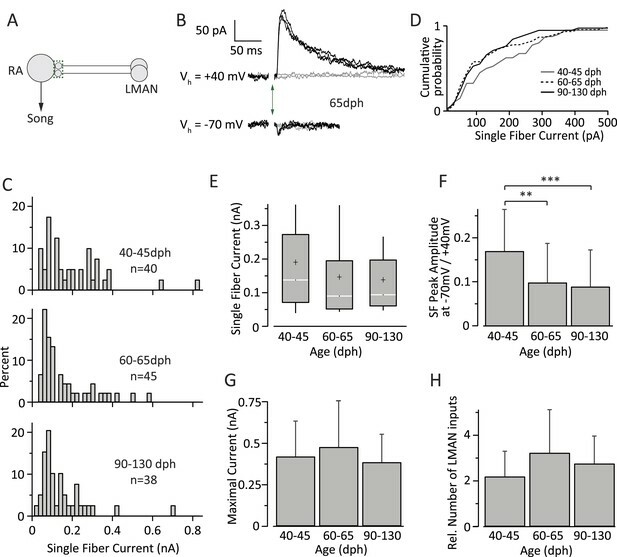 The decay kinetics of NMDA-mediated currents at the LMAN to RA synapse are known to become faster with age, similar to developmental changes described at other vertebrate central synapses, especially in the mammalian neocortex. Although these changes are most often associated with sensory learning of various kinds, it would be useful to know whether a slower time course in the LMAN to RA synaptic current has an effect on RA spike variability. 2) I appreciate the authors' clarification of the novelty of their findings. I certainly agree that theirs “… is the first study to describe the functional changes in the inputs to RA from both HVC and LMAN during song development…”, and for that scope I believe the study is important and not merely incremental. And the detailed explanation they provided for why they view their characterization of the developmental changes at the HVC to RA synapse was also helpful, although I still maintain that those changes could be at least partly inferred from earlier structural and functional studies by Hermann, Kittelberger and Canady. This is not to minimize the current study's importance, but I do believe the authors could go further in integrating the earlier work into their present writing to better highlight exactly what is new here and also to more accurately place their study in the published literature. With due respect to the authors' different perspective, I see pretty clear evidence of functional strengthening and consolidation at the HVC to RA synapse from those earlier studies when they are viewed collectively: over development, HVC bouton number in RA declines, spine density of RA projection neurons describes an inverted “U,” and the functional efficacy of the HVC to RA synapse increases. Further, Canady's serial EM reconstruction work (albeit in canary) revealed that HVC synapses are mostly (>90%) onto spines, whereas LMAN synapses are split between spines and shafts; because HVC synapses far outnumber LMAN synapses on single RA neurons (I believe the ratio was greater than 20:1, but it's been awhile since I have read it thoroughly), Canady concluded that the vast majority of inputs onto spines of RA dendrites reflected input from HVC and from other RA neurons and not from LMAN. I think it is reasonable to assume from this that the developmental changes in RA spine density reported by Kittelberger mostly reflect reorganization from those two sources and not from LMAN. This postsynaptic change is paralleled by a reduction in the frequency of putative HVC axonal boutons in RA; taken together, this seems to provide pretty clear structural evidence of a reduction in the number of HVC to RA synaptic connections with development. Lastly, those structural changes are accompanied by increased efficacy in the HVC to RA synapse, as measured by the stimulus current, EPSP onset slope relationship, which steepens significantly between 45 d juveniles and adults. At face value, this suggests to me that the HVC to RA synapse undergoes developmental consolidation in a process that involves synaptic pruning and strengthening. Regarding determination of locus: Kittelberger's measurements of onset slope largely avoided the potential confound of polysynaptic components. He also found that spontaneous EPSC amplitudes increased (with LMAN lesions, which mimicked the developmental effects), making it less likely that the change in the stimulus-response relationship simply reflected changes in HVC fiber excitability. He noted a reduction in HVC bouton frequency along with decreased spine density and increased stimulus-response relationship. In aggregate, these findings strongly suggest to me a developmental process in which HVC synapses are pruned and strengthened, thus partially anticipating one aspect of the current study. Nonetheless, the current study goes well beyond this by providing more direct evidence of such consolidation while also providing an exact estimate of the numbers of inputs at a greater range of developmental points. I leave it up to the authors to decide whether they see room for improvement in their discussion on these points. In my view, it takes nothing away from the current study to do so, and I do believe that a more balanced discussion of the relationship of the current study to this earlier work would be an improvement. We were very pleased that the reviewers found our results interesting, and the manuscript clear and well written. While the comments we received were generally very insightful and constructive, there was an unfortunate misreading of prior work that raised questions about the novelty of our study, a concern that dampened the reviewers’ enthusiasm for our paper. Below we show that our results could neither have been predicted nor inferred from published work. Importantly, the main conclusion of the paper, how learning‐ related strengthening and pruning of action‐specific connections in a motor control network allows motor variability to be reduced, could not have been arrived at without the new data we provide. We thank the reviewers for their insightful and constructive comments, which have resulted in a much-improved manuscript. A point-by-point response follows. We thank the reviewer for this suggestion, which we have adopted verbatim. We have significantly expanded the model and have now included it in the Results section. Though there are NMDA receptors at HVC‐RA synapses, HVC drives singing predominantly through AMPA receptors. Blocking NMDA receptors in RA has no discernible effect on the HVC‐driven stereotyped core song. This is true both in juvenile (Ölveczky et al., 2005) and adult birds (Charlesworth et al., 2012). Hence, we used AMPA currents to probe the functional strength of HVC input to RA. LMAN, on the other hand, exerts its effect on RA neurons predominantly through NMDA receptors (Mooney and Konishi, 1991). This is now clarified in the text. This is an important point and well taken. As the reviewer suggest in the above paragraphs, even a small effect, if real, can be made statistically significant by increasing the number of observations. This is illustrated by a power calculation we did assuming log‐normal distributions and a CV of 0.88 (taken from our LMAN data) (Author response image 1A). The smaller the difference in the means of two distributions (means ratio closer to 1), the larger the sample size (n) required to detect a statistically significant effect. Our current sample size (∼40) is powered to detect means ratios<0.65 between two distributions with a power greater than 0.8. The means ratio between age group 1 (40 dph) and 2 (60 dph) was 0.75 (p=0.12). If we increased our sample size 2.5 fold to ∼100 for each group we would be powered to detect this ratio as a significant effect. We also ran simulations assuming log‐normal distributions for the LMAN‐stimulation evoked SF currents (Author response image 1B). We estimated these distribution for each age group from the log‐normal fits to the recorded SF distributions, and ‘sampled’ from them randomly, using different number of samples. Increasing the sample number did not result in a significant effect when comparing age groups 2 and 3 (Author response image 1B). This was perhaps not surprising since the effect size in our data set was very small (means ratio = 0.97; p‐value = 0.75). Thus we feel confident in saying that LMAN input to RA remains largely unchanged from 60 dph into adulthood. We note that despite no major change in LMAN drive to RA during this period, there is a very significant decrease in song variability (Ölveczky et al., 2011). We show that this decrease can be explained by developmental changes in HVC‐RA connectivity (Author response image 2). As suggested by the power calculation above (Author response image 1A), the simulations revealed that increasing the number of samples for LMAN‐evoked SF currents in age groups 1 and 2 may end up showing a statistically significant (p<0.05) difference in mean strength across the age groups. While the sample size (n) for our LMAN recordings is already well above the norm for slice physiology experiments in songbirds, which tend to be in the tens (e.g. Kittelberger and Mooney, 1999; Sizemore and Perkel, 2011; Stark and Perkel, 1999; Wang and Hessler, 2006), we agree with the referee that it makes sense to track down small effects if they materially influence the conclusions we draw. 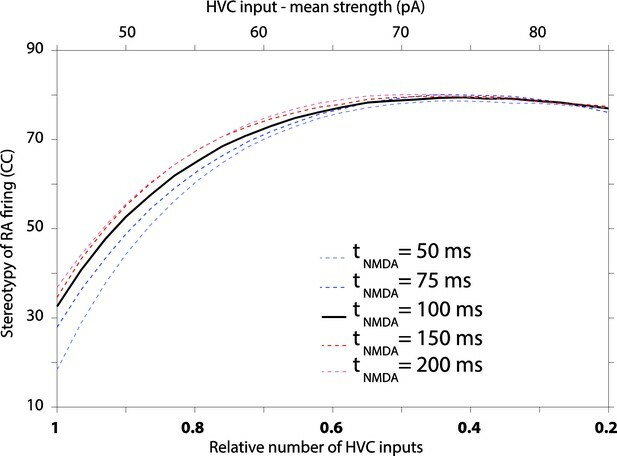 Would a modest decrease in LMAN input strength (if real) challenge the conclusion that strengthening and pruning of HVC‐RA connections reduces motor variability? To test this we followed the reviewer’s suggestion and expanded our model to probe the effects of changing LMAN input strength by up to 50% each way (Author response image 2A). Strengthening and pruning of HVC‐RA synapses leads to reduced variability, and this trend is robust to changes in either LMAN input strength (A) or intrinsic properties or RA neurons (B). Both panels show average pair‐wise cross‐correlation (CC) between spike trains for different ‘song’ renditions in our model network. The x‐axis shows the mean synaptic strength of HVC input to RA (top) and the relative sparseness of HVC input to RA (bottom: 0 – all HVC neurons connect to the RA neurons, but weakly. 1 – a single, strong input from HVC). The model was parameterized to conform to the experimental data (white/grey circle denotes model parameters matching the observations in age groups 2 and 3, respectively). The strength of LMAN input was kept constant throughout. Tonic inhibition onto RA neurons was assumed proportional to the HVC drive. These parameters kept the firing rates of model RA neurons around 50 Hz, i.e. in their normal range during singing (Ölveczky et al., 2011). Note that the total drive from HVC to RA (which drives stereotyped firing) actually decreases as HVC inputs sparsen (LMAN, the variability inducing input stays the same). Thus, the reduced variability is due to a reorganization of HVC‐RA synapses, not a change in total input drive. As is evident from these simulations (Author response image 2A), having developmental changes in LMAN input would not affect our conclusion that reorganization in HVC‐RA connectivity regulates variability during learning. Even a 50% decrease in LMAN strength (a gross overestimate based on our data), when accompanied by strengthening and pruning of HVC‐RA synapses (now parameterized to fit our experimental observations), only explains ∼20% of the total change in variability. The rest (∼80%) is accounted for by changes in HVC‐RA connectivity. This simulation also suggests that variability reduction that may come from reduced LMAN input strength is largely independent of the variability reduction that result from strengthening and pruning HVC‐RA synapses. This is an interesting observation since it suggests that variability in RA can be regulated in (at least) two independent ways: (i) by changing overall LMAN drive, and (ii) by reorganizing HVC‐RA connectivity. Importantly, it means that the conclusion of the paper, i.e. that strengthening and pruning of action‐specific connections in motor control circuit regulate variability, is robust to possible developmental changes in LMAN‐RA connection strength. We also tested whether changes in the F–I curves of RA neurons would impact our conclusions and show that, as the reviewer predicted, they do not (Author response image 2B). 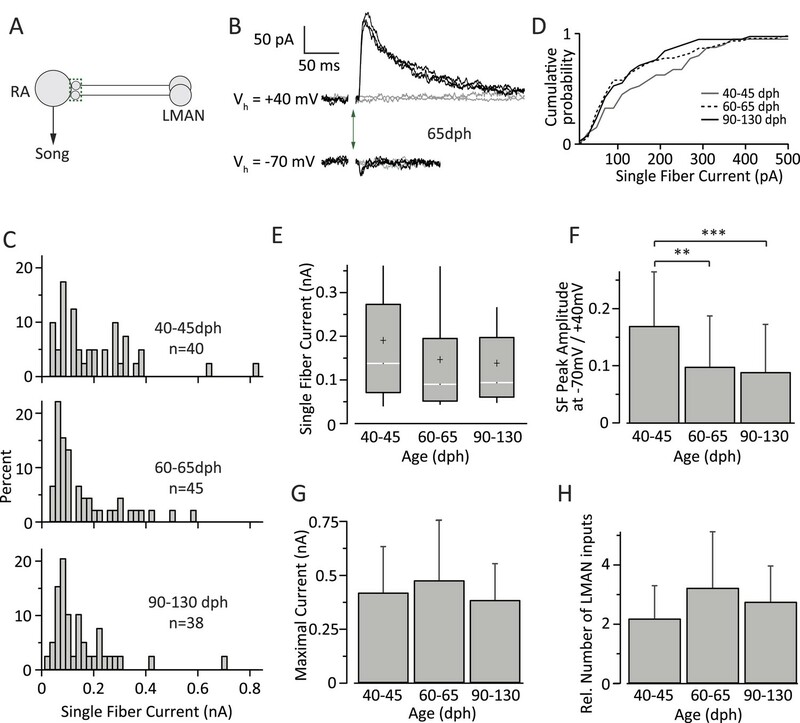 Beyond the expanded model, which now includes analyses of how possible developmental changes to LMAN‐RA connections and intrinsic properties of RA neurons may impact variability, we now acknowledge the possibility that there may be modest age‐related changes in LMAN input early in learning (between age group 1 and 2). We show that while such changes are likely to affect variability, those effects are largely independent (i.e. additive) of the significantly larger effects resulting from the developmental reorganization of HVC‐RA connections. Our finding that the learning‐related reduction in variability can be accounted for by the strengthening and pruning of HVC‐RA connections thus remains firm. 2) The authors compute the relative number of synaptic inputs using a statistic based on that used by Hooks and Chen (2006). However there are several important (and potentially problematic) differences between that earlier analysis and the one used here. Hooks and Chen calculated the ratio of single fiber current divided by the maximum current (SF/MAX), whereas the authors of the paper under review compute the reciprocal of this quantity (MAX/SF). Hooks and Chen's approach prevents large biases from low single fiber currents that would make the MAX/SF ratio quite large. After averaging this ratio for all measured single fibers, Hooks and Chen then invert it to estimate relative number. Importantly, Hooks and Chen calculate this statistic for each measured single fiber current ‘individually’, whereas the paper under review takes every maximum current and divides it by the ‘average’ single fiber current for that age group. It seems like SF/MAX should first be calculated for each single fiber input, as in Hooks and Chen, and then averaged. We used the quantity of MAX/mean(SF) to estimate the relative number of inputs to a cell because we believe it is a better and less noisy estimate than the alternative. The assumptions underlying our choice were not made clear in the manuscript and this has now been remedied. We assume, as does Hooks and Chen, that MAX currents reflect the linear sum of all SF inputs reaching the cell, and that the one (or in our case sometimes two) SF measurement we make in a cell is a less reliable measure of the average strength of the cell’s inputs than the average strength of all inputs to all cells in the given age category. In the case of the retinogeniculate synapse (Hooks and Chen, 2006), all but a few inputs (∼3) are eliminated, with the remaining inputs being strong and showing limited variability. In contrast, HVC to RA connection are both more numerous and vary more in strength, making the fiber fraction a less reliable estimate of average input strength. This is why we used MAX/mean(SF) to estimate the relative number of inputs to a given cell. However, this is not a crucial choice. If we instead estimate the fiber fraction a la Hooks and Chen for each SF, average these together, then invert the number to estimate the average number of inputs, we get very similar numbers. In fact, the trend we report on (hyper innervation followed by pruning) is slightly more pronounced (relative number of inputs for age categories 1, 2 and 3 = 19, 28, 8 respectively, compared to 19, 26, and 11 using our preferred method). While we prefer to use MAX/mean(SF) to estimate the relative number of inputs to a cell, we wholeheartedly agree that the underlying assumptions should have been clearer. In addition, we now also quote the numbers with the alternative calculation. Moreover, the distributions shown in Figures 3B and 4C are skewed to the right, making the mean a poor choice for calculating the relative number. We don’t believe that the distribution being skewed changes how best to estimate mean input strength. We are not estimating the most likely input strength, but the mean input strength across the population of inputs. Additionally, as many readers will not be familiar with this analysis technique the pros and cons of this approach should be discussed in greater detail to clarify the underlying assumptions. We completely agree that the assumptions should have been made clearer to avoid any misunderstandings. This includes the assumption that inputs sum linearly, and that we estimate the average input to a cell from the average strength in the population. We now clarify these underlying assumptions in the text. 3) The modeling section should be expanded and moved from the Discussion into the Results section. We have now significantly expanded the modeling part of the paper, largely in response to the reviewers’ excellent comments (see Author response images 2 and 3). The model has been moved to Results, where we agree it belongs. In the current study, LMAN input is modeled as a single Poisson input with a fixed rate, although the firing rate of LMAN neurons, while variable, is modulated over the course of a motif. Are the conclusions based on the model robust to RA neurons receiving multiple, time varying inputs from LMAN? I suspect that the answer is yes; however demonstrating this would make the model results more convincing. The only recordings (that we know of) from identified RA‐projecting LMAN neurons during undirected singing show no significant song‐locking (Ölveczky et al., 2005). While other reports in the literature show examples of time‐varying LMAN firing (e.g. Kao et al., 2008), those recordings were not from verified RA‐projecting LMAN neurons, and hence could have been interneurons or Area X projecting neurons. In light of this, we feel that modeling LMAN input to RA neurons as Poisson is justified. We have added this motivation to the text. To address the reviewers concern, however, we did probe whether having time‐varying LMAN inputs to RA impacts our conclusion. As the reviewer predicted, it does not. Strengthening and pruning of HVC‐RA synapses still decreases the variability in RA neuron firing (Author response image 3A), but because a strongly time‐varying LMAN input is less variable than a Poisson input, variability in RA, as compared to random LMAN input, is reduced. Again, this effect is largely independent of the effect on variability coming from reorganization of HVC‐RA synapses. However, a single Poisson process may not adequately capture the spike train statistics of LMAN neurons, which tend to fire high‐frequency bursts amidst what can be well described as Poisson firing. Thus, we also extended our model of LMAN firing by adding Poisson‐like bursting. This also did not change the conclusion (see Author response image 3B), though made RA firing more variable, suggesting that bursting in LMAN is an efficient way of driving variability in the motor pathway, an interesting result in its own right. Strengthening and pruning of HVC input to RA causes a reduction in variability regardless of whether LMAN firing is Poisson, Poisson with added Poisson bursts, or time varying. A. Average pair‐wise cross‐correlation (CC) between spike trains during different ‘song’ renditions in our model network assuming LMAN input with different structure and statistics. B. LMAN spike trains for 100 ‘song renditions’ simulated using (top) a Poisson process of constant rate, (middle) a Poisson process with added Poisson bursting, and (bottom) a time‐varying Poisson process. Blue curve shows the time‐varying modulation in the firing rate of the Poisson process. Also, it is surprising that the authors do not parameterize their model with the distribution of single-fiber synaptic strengths presented in the first part of the paper (the fact that model inputs are expressed in units of mV makes it hard to assess whether the model distribution is similar to the distribution observed experimentally). Would the key model results hold true using a more realistic distribution of input strengths? This is a great point, and we have now done what the reviewer suggested. We parameterize the strengthening and pruning to fit the experimental data and find that the key results from the simpler simulation still very much hold (Author response image 2A). We thank the reviewer for this suggestion as it makes our point even stronger. Regarding novelty: prior anatomical and physiological studies have documented changes in the relative strength and numbers of HVC synapses on RA neurons over song learning in zebra finches, and also had characterized the intrinsic properties of RA neurons over a similar time course. We respectfully disagree on this point. We believe this misunderstanding stems from our manuscript not adequately distinguishing the current study from prior work. Below we draw this contrast and show that our results on how the number and strength of HVC input to RA changes during development could not have been inferred from prior studies. We have added a paragraph to the manuscript contrasting our experiments with previous studies (though less detailed than the discussion below), to clarify this issue. One anatomical study from Herrmann and Arnold, 1991, shows that the number of synaptic inputs onto RA dendrites changes with development. Counting synaptic contacts in bulk RA tissue, however, does not say anything about the number of inputs to single RA neurons, or about the functional strength, or about number of HVC fibers that connect to single RA neurons. Another paper specifically mentioned in the referee report was Kittelberger and Mooney’s 1999 study. The authors looked at various metrics of how the RA network reorganizes following lesions to LMAN and during normal development. The experiments reported on, however, were not designed to probe the logic by which HVC inputs innervate RA or how this changes with development. One experiment we believe the reviewer may be referring to involved filling RA projection neurons and counting spines. 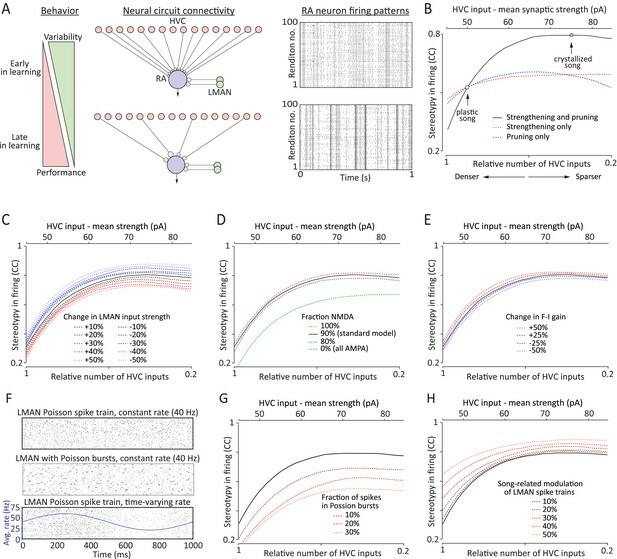 Though spine numbers differ between juvenile and adult birds, there is no way to infer what this means in terms of changes to the number or strength of HVC inputs to single RA neurons. First, spines on RA dendrites reflect input from both LMAN and RA, and thus a change in spine number can’t be cleanly attributed to changes in HVC (or LMAN) input. And even if they could somehow be parsed, synaptic inputs from HVC (and LMAN) are onto both dendritic shafts and spines, meaning that spines only tell half the story. Moreover, it is not clear how to relate the number of spines on RA dendrites to the number of unique HVC (or LMAN) inputs. Lastly, counting spines does not say anything about the functional strength of the inputs. Another experiment in Kittelberger and Mooney (1999) may, at first glance at least, look similar to ours. The authors make sharp intracellular recordings in RA projection neurons and measure EPSPs evoked by HVC fiber tract stimulation. They show that the relationship between stimulation intensity and initial slope of the evoked EPSP changes. However, the extent to which this effect is due to changes in the excitability of HVC fibers, faster polysynaptic response to HVC stimulation, more numerous HVC inputs or increased synaptic strength of HVC‐RA synapses simply cannot be parsed, and the authors state as much in their paper. Thus it is simply not possible to infer the distribution of synaptic strengths and relative number of inputs from this paper. This is not meant as a criticism of Kittelberger and Mooney’s study. Their intention was not to uncover the functional logic by which HVC neurons innervate RA projection neurons. We have repeatedly consulted with Richard Mooney about our experiments, and he has encouraged us to perform them, as he believes, as do we, that they fill an important gap in our understanding of how the song system learns and develops (personal communication). While we disagree with the assertion that the relative change in number and strength of HVC input to RA has been characterized, we agree that the intrinsic properties of RA neurons have been previously examined, and we acknowledge as much in the paper. We nevertheless repeated these experiments for three reasons: (i) to have measurement of intrinsic properties for the same age‐groups where we characterize the connectivity strength (Kittelberger and Mooney did one measurement in juvenile and one in adult); (ii) to interrogate the intrinsic properties in a more physiological range (higher temperatures and at higher instantaneous firing rates); (iii) to look at intrinsic properties with whole cell recordings rather than sharps, thus better controlling for leak currents. Our results are similar to those of Kittelberger and Mooney. As they are not providing a novel result (though we maintain they could have), we debated whether or not to include them in the paper. We decided to do this for the reasons we initially did the experiments (see above) and because we believe it is good for the field to see that results can be robustly replicated across labs and with different recording techniques. Thus, the characterization of LMAN synapses on RA neurons over song learning is the novel experimental data set provided here; the modeling study is also novel. Whether these together provide enough of an advance and will appeal to a broader readership is hard for me to assess. As a songbird researcher, I find the results very interesting and they help to articulate how the consolidation of HVC synapses on RA neurons could act as a counterweight to suppress noise from LMAN inputs. I would be interested to hear what the other reviewers' thoughts are about this. We appreciate the kind words, and hope that the reviewer agrees that there is also great virtue in better elucidating the logic by which the descending motor control system (i.e. HVC‐RA) is wired up during learning, and that our data provide new insights in this regard. We appreciate the spirit of this comment, and agree that it would be great to manipulate HVC‐RA connectivity and/or song variability in an experimentally tractable way, and directly relate the two. Deafening and auditory perturbations, however, are likely to affect and disrupt brain circuits well beyond the HVC‐RA circuit (Horita et al., 2008; Tschida and Mooney, 2012), making the interpretation of such experiments confounded and difficult. The current paper relates changes in RA circuitry during initial learning and development to the regulation of motor variability. It is not clear that increased variability after deafening or other perturbations would engage the same or similar mechanisms. Moreover, our contention is not that strengthening and pruning of HVC‐RA synapses is the only way to influence variability, and we now show that other mechanisms can contribute (Author response images 2 and 3). Rather, the point we would like to make is that strengthening and pruning of HVC‐RA synapses is an important, and likely dominant, mechanisms for regulating variability during normal development. We thank the reviewers for their insightful comments in this and the previous round of review. The constructive comments have significantly improved the manuscript. Below we respond point-by-point to the reviewers’ comments. These are good points; we have now clarified, in the figure legend and text, which model we make the comparisons against. The lines in the figure have been darkened to make them more legible. This is a great point and we have now done what the reviewer suggested. It turns out that pruning and strengthening connections from HVC to RA contribute to reducing variability on their own, but not nearly as much as when the two processes co-occur. I.e. the process of strengthening AND pruning has a much larger effect on variability than either strengthening OR pruning alone. We have added this result to Figure 6B, and discuss the implications of this in the text. It’s a good question. We initially chose not to explore variation in NMDA kinetics, since available data from zebra finches suggest that it does not change over the course of sensorimotor learning (Stark and Perkel, 1999). In response to the reviewer’s comment, however, we changed NMDA kinetics in our model. We find that even a fourfold change in the decay constant has only a minor effect on variability (see Author response image 4 below). However, the simulations suggest that a decrease in this time constant, i.e. the trend seen during early development of neocortical NMDA synapses, actually increases variability, thus offering no explanation for the decreased variability in motor output. This result, however, may be confounded by another issue, which is that changing the time constant results in significant changes to RA firing rates. Decreasing the NMDA time constant from 100 ms to 50 ms, for example, reduces the average firing rate of model RA neurons from ∼50 Hz to ∼20 Hz. To keep the firing rate constant, we would need to tweak the model in ways that could also affect variability. Moreover, since most parameters in the model are already determined by our data, additional ‘tweaks’ would need to be justified. We note that changes to other parameters in the model over the ranges reported in the paper (Figure 6) did not materially affect the average firing rate of RA neurons. Given that there is (i) no indication of a change in NMDA kinetics during sensorimotor learning in zebra finches, (ii) that changing the time constant in the model effects RA firing rates in a way that may confound the interpretations of the results, and (iii) since the effect on variability is modest, we would rather not include or discuss this result in the paper. Doing so, in a responsible way, would require quite a bit of elaboration, something we feel would take the focus away from the other results. The effect of varying decay kinetics of NMDA currents in our model results in modest changes to RA variability, with longer time constants producing more stereotyped firing. With due respect to the authors' different perspective, I see pretty clear evidence of functional strengthening and consolidation at the HVC to RA synapse from those earlier studies when they are viewed collectively: over development, HVC bouton number in RA declines, spine density of RA projection neurons describes an inverted “U,” and the functional efficacy of the HVC to RA synapse increases. Further, Canady's serial EM reconstruction work (albeit in canary) revealed that HVC synapses are mostly (>90%) onto spines, whereas LMAN synapses are split between spines and shafts; because HVC synapses far outnumber LMAN synapses on single RA neurons (I believe the ratio was greater than 20:1, but it's been awhile since I have read it thoroughly), Canady concluded that the vast majority of inputs onto spines of RA dendrites reflected input from HVC and from other RA neurons and not from LMAN. I think it is reasonable to assume from this that the developmental changes in RA spine density reported by Kittelberger mostly reflect reorganization from those two sources and not from LMAN. This postsynaptic change is paralleled by a reduction in the frequency of putative HVC axonal boutons in RA; taken together, this seems to provide pretty clear structural evidence of a reduction in the number of HVC to RA synaptic connections with development. There seems to be a species-difference here as Herrmann and Arnold (1991) report that, in zebra fiches, ∼40 % of HVC synapses are onto dendritic shafts. In zebra finches they also see a more balanced mix of synaptic contacts from HVC and LMAN onto RA dendrites than does Canady in canaries. That being said, we fully agree that the anatomical studies are consistent with our results and we now emphasize this further in the text. Yet there is no unambiguous way to predict from these structural studies how the organization of single fiber inputs to RA changes with development. This is because changes in the number of synaptic contacts could reflect changes in the number of functional inputs or fewer contacts per input. Moreover, the structural studies say little about the functional strength of the synapses. We believe our study, which focuses on the changes in the strength and number of single fiber inputs, nicely compliments previous anatomical work, giving us a more complete picture of the changes that accompany song learning. Lastly, those structural changes are accompanied by increased efficacy in the HVC to RA synapse, as measured by the stimulus current, EPSP onset slope relationship, which steepens significantly between 45 d juveniles and adults. At face value, this suggests to me that the HVC to RA synapse undergoes developmental consolidation in a process that involves synaptic pruning and strengthening. We agree that Kittelberger’s study is consistent with the picture we find, but maintain that it is also consistent with other possibilities (continued developmental strengthening of single fiber inputs from HVC without pruning with each single fiber having fewer synaptic contacts, for example). We now acknowledge that the results from the Kittelberger study is consistent with ours, but point out that our findings provide essential new insight into the logic of how RA connectivity changes during learning. We acknowledge the contributions of Yoram Burak and Alexis Dubreuil to an earlier version of the HVC-RA-LMAN model. We thank Michael Long, Chinfei Chen, Takao Hensch, Venkatesh Murthy, Maurice Smith, Maximilian Josch, Evan Feinberg, and members of the Ölveczky lab for helpful discussions and feedback on the manuscript. This work was supported by a grant from NINDS (R01 NS066408), a McKnight Scholar Award and Klingenstein Fellowship to BPÖ, and a Swartz Foundation post-doctoral fellowship to BB. Animal experimentation: The 124 male zebra finches (Taeniopygia guttata) used for this study were obtained from our breeding colony. The care and experimental manipulation of the animals were carried out in accordance with guidelines of the National Institutes of Health and were reviewed and approved by the Harvard Institutional Animal Care and Use Committee (Protocol #: 10-09). © 2014, Garst-Orozco et al.